ABSTRACT: The objective in this study was to identify meteorological variables related to the sensorial quality of the coffees from Mantiqueira region in Minas Gerais. Meteorological conditions are strongly related to the coffee’s sensorial characteristics, however, there aren’t many studies quantifying this relation. Air temperature and rainfall data were collected and spatialized for regional analysis. These were associated to the 2007 through 2011 coffees’ beverage scores. The region was stratified according to relief characteristics. The bigger frequency of high scores occurred on the region’s central-south, where coffee cultivation is performed above 900 m altitude. For the in loco study, meteorological data and coffee samples were collected in selected pilot areas. Coffee crops were selected in three altitude ranges: below 1000 m, between 1000 and 1200 m, and over 1200 m. Above 1000 m the meteorological variable that presented the biggest variation was the air temperature. Above 1000 m the smallest thermal amplitude occurred, which provided superior quality coffees. 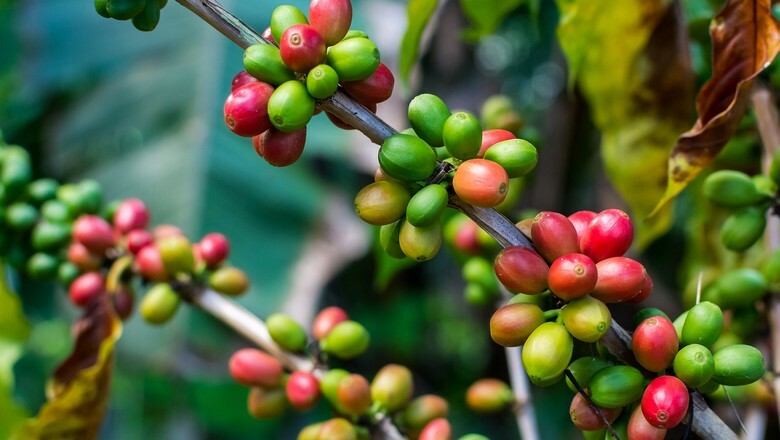 The study demonstrates the importance of the meteorological variable characterization aiming to identify locations with greater vocation to the specialty coffees production. Index terms: Coffee production, agrometeorology, thermal amplitude, altitude. RESUMO: Objetivou-se com este estudo identificar variáveis meteorológicas que estão relacionadas à qualidade sensorial dos cafés da região da Mantiqueira de Minas Gerais. Condições meteorológicas são fortemente associadas às características sensoriais dos cafés, porém estudos que quantificam essa relação ainda são escassos. Para análise regional foram coletados e espacializados dados de temperatura do ar e precipitação pluvial, que foram relacionados com as notas de bebida dos cafés nos anos de 2007 a 2011. A região foi estratificada em função das características do relevo. A maior frequência de melhores notas da bebida ocorreu nos municípios localizados na área centro-sul da região, mais frios e chuvosos, e onde a cafeicultura localiza-se acima de 900 m de altitude. Para o estudo in loco, foram selecionadas áreas piloto para coleta de dados meteorológicos e de amostras de café. Foram selecionadas lavouras de café localizadas em três faixas de altitude: abaixo de 1000 m, entre 1000 e 1200 m e superior a 1200 m. Acima de 1000 m a temperatura do ar foi a variável meteorológica para a qual se verificou maior diferença. Acima de 1000 m ocorreu menor amplitude térmica do ar, o que proporcionou cafés com qualidade superior. O estudo demonstra a importância da caracterização de variáveis meteorológicas visando a identificação de locais com maior vocação para produção de cafés especiais. Termos para indexação: Cafeicultura, agrometeorologia, amplitude térmica, altitude. 1 INTRODUCTION The coffees produced at Mantiqueira region, located Southern Minas Gerais, have been gaining increasing recognition from the market, for they provide beverage with distinct sensorial characteristics. The crops are located in different environmental conditions and many climatic variables may be related to the coffees’ sensorial characteristics. 1, 2Universidade Federal de Lavras/UFLA - Departamento de Engenharia/DEG - Cx. P. 3037 - 37.200-000 - Lavras - MG flavioborem@deg.ufla.br, marcospauloluz@gmail.com 3 Universidade Federal de Lavras/UFLA - Departamento de Estatística/DES - Cx. P. 3037 - 37.200-000 - Lavras - MG - safadi@des.ufla.br 4 Empresa de Pesquisa Agropecuária de Minas Gerais/Unidade Sul Campus UFLA - Cx.P. 176 - 37.200-000 - Lavras - MG margarete@epamig.ufla.br 5 Empresa Brasileira de Pesquisa Agropecuária/Embrapa Café - Parque Estação Biológica - PqEB s/n - 70770-901 - Brasília - DF helena.alves@embrapa.br 6 Universidade Federal de Lavras/UFLA - Departamento de Biologia/DBI - Cx. P. 3037 - 37.200-000 - Lavras - MG - tristao@dbi.ufla.br 7 Instituto Nacional de Pesquisas Espaciais/INPE - Pós-Graduação/Sensoriamento Remoto - 12.227-010 - São José dos Campos - SP - daniel.maciel@inpe.br Among the environmental variables related to the coffee’s sensory quality, the altitude has been the most studied (Figueiredo et al., 2013; Barbosa et al., 2014; Silva et al., 2015). However, altitude’s effects are considered to be indirect, for its variation results in different climatic conditions for the environment. Climate and soil characteristics are among the factors that most affect the coffee trees development (Guyot et al., 1996; Joët et al., 2010). Coffee Science, Lavras, v. 14, n. 1, p. 38 - 47 jan./mar. 2019 Meteorological variables and sensorial ... 39 crops are located between 900 and 1000 m and 50% between 1000 and 1400 m. Data provided by AGRITEMPO (MAPA, 2014) were used to spatialize the meteorological variables. The location of the weather stations is shown in Table 1. Spatial distribution maps of annual precipitation and maximum and minimum temperature were obtained using the Inverse Distance Weighting interpolation, which has presented the best results for the region. To describe the region’s coffee sensory quality, beverage scores from the 2007/2008 through 2010/2011 harvests were handed over by the sectors companies that directly work in the region. Highest scores maps were elaborated for each harvest. Spatial distribution of annual precipitation and maximum and minimum temperature data were associated to the coffee’s beverage scores. Pilot areas were selected at Carmo de Minas for collection of meteorological data and coffee samples. Automatic weather stations were installed in coffee crops located at three altitude ranges (below 1000 m, between 1000 and 1200 m, and over 1200 m). Air temperature, relative humidity, solar radiation and precipitation data referring to the 2011/12 and 2012/13 harvests were collected. The description of the coffee beverage sensory quality was carried out using field collected samples, by altitude range. The harvest was performed manually and selectively, collecting only mature fruits, which were processed according to Borém (2008) recommendations. In Central America, studies demonstrate that the average temperature during seed development has influenced the sensorial profile. Positive quality attributes, such as acidity, fruity character and flavor quality have been correlated to the coffee production in cooler microclimates (Bertrand et al., 2012). Workuad et al. (2018) observed that the sucrose content and acidity increase with altitude. Studies performed at Mantiqueira region showed that coffee quality depends on the interaction between genotype, processing and altitude (Ribeiro et al., 2016; Ramos et al., 2016). This study’s purpose was to identify meteorological variables related to the sensorial quality of the coffees from Mantiqueira region in Minas Gerais and demonstrate the importance of the meteorological characterization to identify locations with greater vocation for specialty coffees production. 4 CONCLUSIONS Air temperature was the meteorological variable to present the biggest difference between the altitude ranges above and below the 1000 m. The difference was around 2.5°C on the hotter months. Above 1000 m, the smallest thermal amplitude for the hotter months occurred, which provided superior quality coffees. The study demonstrates the importance of the meteorological characterization aiming to identify locations with greater vocation to the specialty coffees production. 5 ACKNOWLEDGMENTS The authors acknowledge CNPq, FAPEMIG, CAPES and Consórcio Pesquisa Café. FIGURE 13 - Correlograms for (A) Minimum Temperature (below 1000 m – between 1000 and 1200 m), (B) Minimum Temperature (below 1000 m – above 1200 m), (C) Average Temperature (below 1000 m – between 1000 and 1200 m), (D) Average Temperature (below 1000 m – above 1200 m), (E) Thermal Amplitude (below 1000 m – between 1000 and 1200 m) e (F) Maximum Temperature (below 1000 m – between 1000 and 1200 m). 6 REFERENCES ALVES, H. M. R. et al. Geotechnologies for the characterization of specialty coffee environments of Mantiqueira de Minas in Brazil. The International Archives of the Photogrammetry, Remote Sensing and Spatial Information Sciences, V. 41-B8, p.797- 799. June 2016. XXIII ISPRS Congress, Commission VIII, Prague, Czech Republic, 2016. AVELINO, J. et al. Effects of slope exposure, altitude and yield on coffee quality in two altitude terroirs of Costa Rica, Orosi and Santa Maria de Dota. Journal of the Science of Food and Agriculture, London, v. 85, n. 11, p. 1869-1876. May. 2005. BARBOSA, J. N. et al. Discrimination of production environments of specialty coffees by means of stable isotopes and discriminant model. Journal of Agricultural Science, Ottawa, v. 6, p. 55-64. Apr. 2014. BERTRAND, B. et al. Climatic factors directly impact the volatile organic compound fingerprint in green Arabica coffee bean as well as coffee beverage quality. Food Chemistry, London, v. 135, p. 2575–2583. July 2012. BORÉM, F. M. Pós-colheita do café. Lavras: UFLA, 2008. v. 1, p. 631. Coffee Science, Lavras, v. 14, n. 1, p. 38 - 47 jan./mar. 2019 Meteorological variables and sensorial ... 47 RIBEIRO, D. E. et al. Interaction of genotype, environment and processing in the chemical composition expression and sensorial quality of Arabica coffee. African Journal of Agricultural Research, Nairobi, v. 11, n. 27, p. 2412-2422, July 2016. SCAA - Specialty Coffee Association of America. 2009. SCAA Protocols - Cupping Specialty Coffee. Long Beach: SCAA. 2009. 7p. SANTOS, M. O. et al. Antioxidant system differential regulation is involved in coffee ripening time at different altitudes. Tropical Plant Biology, Switzerland, v. 11, n. 3, p. 131–140, June. 2018. SILVA, S. de A. et al. Mapping the potential beverage quality of coffee produced in the Zona da Mata, Minas Gerais, Brazil. Journal of the Science of Food and Agriculture, London, v. 96, n. 9, p. 3098–3108, Oct. 2015. VIANELLO, R.L. ; ALVES, A.R. Meteorologia básica e aplicações. 2.ed. Viçosa: Ed. da UFV, 2012. 460p. WORKUAD, M. et al. Effect of altitude on biochemical composition and quality of green arabica coffee beans can be affected by shade and postharvest processing method. Food Research International, London, v. 105, p. 278-285, Mar. 2018. FIGUEIREDO, L. P. et al. The potential for high quality bourbon coffees from different environments. Journal of Agricultural Science, Ottawa, v. 5, n. 10, p. 87–98, Sept. 2013. GUYOT, B. et al. Influence de l’altitude et de l’ombrage sur la qualité des cafés Arabica. Plantations Recherche Développement, Paris, v.3, n. 4, p. 272–280, July – Aug. 1996. JOËT T. et al. Influence of environmental factors, wet processing and their interactions on the biochemical composition of green Arabica coffee beans. Food Chemistry, v. 118, n. 3, p. 693–701, Feb. 2010. MAPA - Ministério da Agricultura Pecuária e Abastecimento, Sistema de Monitoramento Agrometeorológico. Available in: . Access in: Jan. 28. 2014. RAMOS M. F. et al. Discrimination of the sensory quality of the Coffea arabica L. (cv. Yellow Bourbon) produced in different altitudes using decision trees obtained by the CHAID method. Journal of the Science of Food and Agriculture, London, v. 96, n.10, p 3543-3551, Aug. 2016. Agora em abril, a região da Mantiqueira de Minas está em comemoração: foram 100 mil sacas de cafés verdes selados pelo Selo Indicação de Procedência Mantiqueira de Minas! Não só garantindo que o produto é produzido em uma área demarcada, o selo, que teve início em 2011, tem como objetivo mostrar que o grão faz parte da cultura do território e que foi produzido seguindo normas e regras estabelecidas para proteger a identidade do patrimônio da região. Os cafés torrados e moídos que levam a marcação estão cada vez mais sendo adquiridos por torrefações, cafeterias, empórios e supermercados no Brasil. Lá fora, os lotes estão sendo exportados para cerca de 14 países. “Alguns dos pontos importantes do Selo Indicação de Procedência Mantiqueira de Minas é a acessibilidade que ele dá ao produto e a ligação que ele faz entre o produtor e o consumidor final. O café é reconhecido pela qualidade e pela rastreabilidade”, disse Wellington Pereira, provador e trader da Cooperativa Regional dos Cafeicultores do Vale do Rio Verde (Cocarive). Nas lavouras, com a visibilidade que a marcação dá para a Mantiqueira de Minas, os produtores estão se dedicando cada vez mais na produção e na qualidade dos cafés especiais da região, recebendo um ágio de até 20% por saca. Agora em abril, a região da Mantiqueira de Minas está em comemoração: foram 100 mil sacas de cafés verdes que receberam o Selo Indicação de Procedência Mantiqueira de Minas! Tomar um café e sentir o aroma caramelizado típico dos grãos do Cerrado Mineiro. Buscar uma bebida mais cítrica exclusiva do Circuito das Águas Paulista. Isso pode parecer conversa de degustador, mas há uma tendência do consumidor no Brasil de saber cada vez mais sobre as características, a origem e a qualidade do produto. Por isso, os cafés especiais estão conquistando o paladar dos brasileiros. O principal atrativo deles é a valorização no mercado. 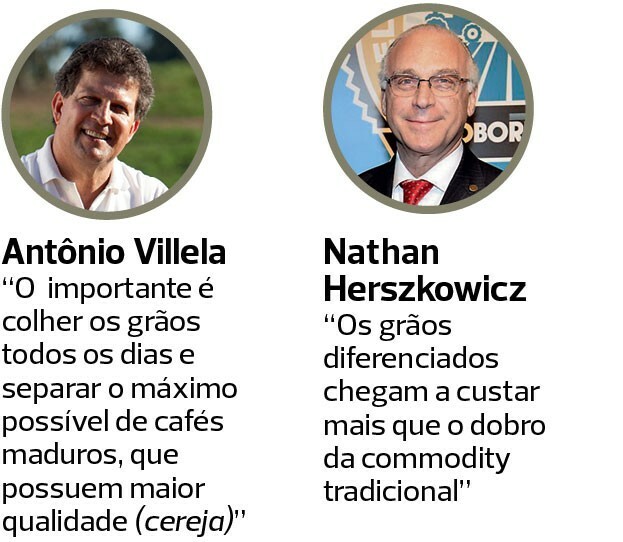 Nathan Herszkowicz, diretor executivo da Associação Brasileira da Indústria de Café (Abic), explica que os grãos chegam a custar mais que o dobro da commodity tradicional. Com relação ao mercado externo, os cafés especiais representam uma fatia de 15% dos 30 milhões de sacas exportadas, diz Herszkowicz, mas no Brasil, a procura por esse produto ainda é tímida. A Abic estima que 4% dos grãos consumidos são gourmet (800.000 sacas por ano), no entanto, esse número pode aumentar para 10% nos próximos 15 anos. De olho no crescimento desse público mais exigente, regiões como Mantiqueira de Minas, oeste da Bahia e Circuito das Águas Paulista estão buscando, por meio de selos de Indicação Geográfica (Denominação de Origem e Indicação de Procedência), o reconhecimento para os seus produtos. Algumas dessas regiões se inspiraram no modelo do Cerrado Mineiro. Em 2013, os produtores de lá foram os pioneiros em provar que o meio geográfico onde estão inseridos (clima, solo, relevo, temperatura e práticas de produção) influencia na qualidade do grão. Eles conseguiram a primeira Denominação de Origem (DO) para o café no Brasil. De acordo com o superintendente da Federação dos Cafeicultores do Cerrado, Juliano Tarabal, nos últimos quatro anos, já foram contabilizadas aproximadamente 500.000 sacas de café com o selo de origem de qualidade. O processo para conseguir o registro, porém, possui custos altos: para conseguir o selo, entidades podem desembolsar até R$ 1 milhão só com despesas de consultoria e estudos, entre outros. Após o reconhecimento, há ainda gastos com a rastreabilidade e ações de marketing. “São vários investimentos, porque a DO sozinha não tem valor”, destaca o cafeicultor. A região de Mantiqueira de Minas, que é conhecida tradicionalmente pela produção dos cafés de montanha, também busca diferenciar seus produtos. Em 2011, conquistou o selo de Indicação de Procedência (IP) e, no ano passado, já certificou 36.000 sacas. Em 2016, também os produtores da Mantiqueira deram um novo passo em busca do selo de Denominação de Origem. Há cinco anos, a região ganhou destaque no mercado externo. Antes, os produtores vendiam para um intermediário, responsável pela exportação, hoje, eles já exportam diretamente para 13 países. Para obter a DO, a região melhorou o processo de pós-colheita. Villela ressalta que é muito importante colher os grãos todos os dias e separar o máximo possível os cafés maduros, que possuem maior qualidade (cereja), dos outros grãos. No final do ano passado, a região do Circuito das Águas Paulista começou a se estruturar para também reconhecer a exclusividade de seu café. Com lavouras situadas na Serra da Mantiqueira entre 850 e 1.350 metros de altitude, o local possui grãos com intenso aroma frutado e floral. A consultora do Sebrae que está acompanhando o processo, Cintia Maretto, afirma que 30 produtores estão reunidos para formar uma associação ainda neste ano. “Eles têm de criar regimentos e padrões de qualidade”, afirma. A região oeste da Bahia também está prestes a receber a primeira Indicação Geográfica, na modalidade de Indicação de Procedência. A Abacafé, associação dos produtores da região, fez o pedido em 2014. Em março deste ano, receberam o parecer do Instituto Nacional da Propriedade Industrial (Inpi) para realizar os últimos ajustes. Segundo Ivanir Maia, consultor que acompanha o processo, o café que receberá o selo será aquele produzido acima de 740 metros de altitude. Na região, as máquinas são responsáveis por realizar os processos de colheita, secagem e também de preparação do solo. Além disso, o clima típico da região nordeste determina diferentes práticas de produção. 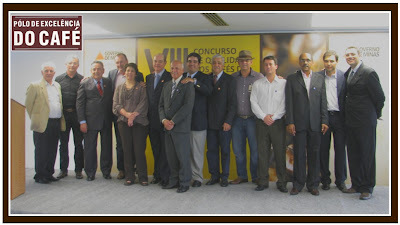 Carmo de Minas, MG – On Friday, November 13, 2015, took place the disclosures of the winners in the 2nd Coffee Quality Contest of Mantiqueira de Minas in the Natural and Pulped Natural categories and the launching of the Seal for coffees in roasted and ground beans proved to be originated from green coffees with geographical identification in the modality Indication of Origin. From now on, Mantiqueira de Minas will make the technology available in QR code for roasters, who may track their coffee lots acquired in the region. The initiative aims to close the gap between the producer and the consumer by uniting the ends of the chain and reinforcing the transparency and traceability in the productive process, in addition to promoting the excellence of the region’s coffees and acknowledging the producers. The event took place at the Clube URCA and counted with the presence of producers, representatives of the local coops and also of SEBRAE (Brazilian Small and Micro Firms Support Services), sponsoring the project of Geographical Indication (IG) of the region. The first place went to Gisela Carneiro Avelar, cooperated at COOPERRITA, obtaining 93 points in the Natural category and José Nicacio Itagiba de Oliveira, cooperated from COCARIVE, obtaining 91.33 points in the Pulped Natural category – SCAA methodology. For this contest coffee samples were sent which had already been distinguished in similar events of the local coops. Among the 46 analyzed samples, the judges selected 13 winning coffees in the Natural category and 12 in the Pulped Natural category. The sample evaluation process was conducted by Q-Grader Judges, under the coordination of tasters from COCARIVE, COOPERRITA and COOPERVASS, cooperatives comprehending Mantiqueira de Minas. According to Antônio José Junqueira Villela, president of APROCAM, entity which represents, controls and promotes Mantiqueira de Minas – IP “the coffees participating in the Contest are all certified with the Mantiqueira de Minas Seal of Origin and Guaranteed Quality. This gives the buyers the certainty of a product reflecting the unique organoleptic characteristics that are only found in our region. The seal, both for green coffee and roasted and ground coffee is proof of our efforts in promoting the Mantiqueira de Minas origin, and also, to enhance our century old tradition in producing unique and surprising coffees”. The winning lots will be available for sale and will be offered to the market. 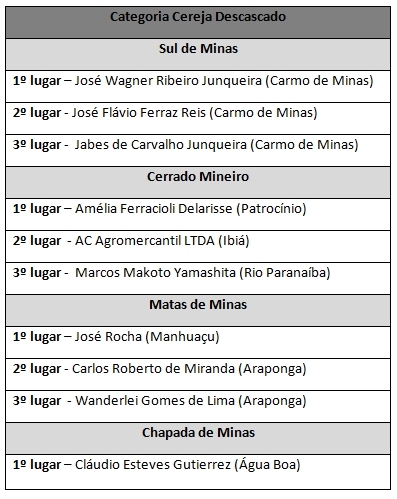 Below is the list of Mantiqueira de Minas winning lots and their respective points. About Mantiqueira de Minas: The region is located in the southern part of the state of Minas Gerais, comprehending 25 municipalities and a farming area of 69,500 hectares dedicated to the production of approximately,1,340,000 coffee bags. This area is distributed among 7,800 producers, mostly owners of small farms. The Indication of Origin is controlled by APROCAM, the entity created to represent and promote the development of the producers in the region. Carmo de Minas, MG – On Friday, January 23, 2015, the winners of the most important natural coffees competition of the planet, the 2014 Brazil Late Harvest Cup of Excellence® Competition, were announced. In line with its uninterrupted tradition beginning in 2012, Mantiqueira de Minas was, once more, the great winner ranking no less than 12 lots among the 23 champions, among which are the six higher ranked in the event. The lot awarded first place obtained 95.18 points according to the SCAA (Specialty Coffee Association of America) methodology. The event was organized by the Associação Brasileira de Cafés Especiais (BSCA, in English) in a partnership with the Agência Brasileira de Promoção de Exportações e Investimentos (Apex-Brasil), the Alliance for Coffee Excellence (ACE) and Sebrae. In the first stage of the contest, a board of Brazilian Judges selected coffee samples from 44 producers. In the final stage of the contest held between January 19 and 23, at the Centro Universitário de Araxá (MG), those samples were submitted to an international jury consisting of representatives from the United States of America, Europe, Asia, South America and Oceania. Antônio José Junqueira Villela, president of APROCAM, entity controlling and promoting Mantiqueira de Minas – PGI celebrates the prize: “we are from a region producing unique and surprising coffees. In 2011, we obtained our Indication of Origin, as a result of a long-lasting effort we endeavored to identify and value the unique elements that form the terroir Mantiqueira de Minas. It reflects the tradition of a coffee culture that found its home on the slopes of beautiful and sunny mountains, provided with a mild, gentle, climate, perfect for very high quality coffees. It reflects the love we nurture for our cultural identity and for the traditions of our ancestors, today still alive in small and century-old farms where coffee is harvested manually. It also reflects the enthusiasm we share, our spirit of vanguard, always perfecting our processes to highlight the best in our coffee. Mantiqueira de Minas is unique, artisanal, a precious gem in Brazil”. Contest winners’ lots will be available in the online auction that will take place on March 10, 2015. About Mantiqueira de Minas - PGI: The region is located in the southern part of the Minas Gerais State, comrising 25 municipalities and a planting area of 69,500 hectares dedicated to the production of approximately 1,340,000 coffee bags. This area is distributed among 7,800 producers, most of them owners of small farms. The Indication of Origin is controlled by APROCAM, entity created to represent and promote the evolution of the region’s producers. Mantiqueira de Minas to hold its 1st Coffee Quality Contest presenting the Seal of Guaranteed Origin and Quality. 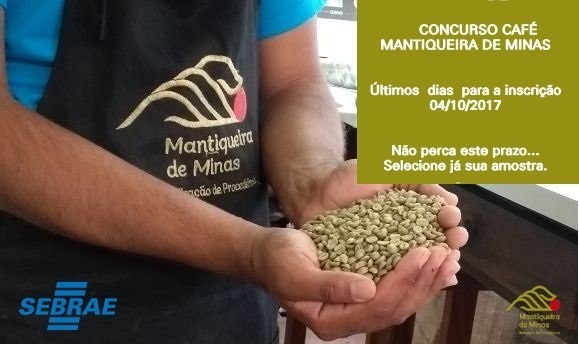 Carmo de Minas, MG, Brazil – On November 14, 2014 the 1st Coffee Quality Contest of Mantiqueira de Minas will take place, with the objective of promoting the excellence of the region’s coffees and also bringing recognition to the producers. The awards ceremony will be hosted at 6 PM, in the Clube Urca, Carmo de Minas (MG) and will be attended by producers, representatives of local coops and also by SEBRAE, the main supporter for the event. 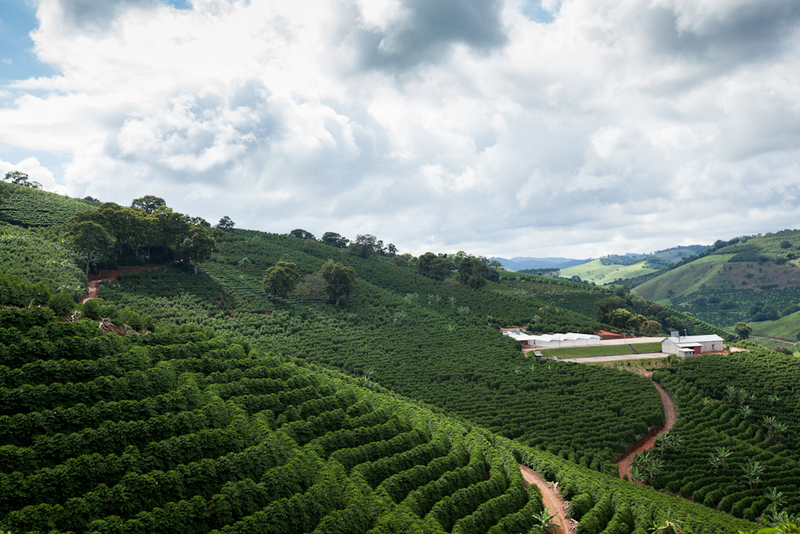 The Mantiqueira de Minas region consists mostly of small producers, reflecting a century-old tradition in the production of rare and surprising coffees; and it is also one of the most award winning regions in Brazil. In January, 2011, it has been recognized as a Protected Geographical Indication (PGI). The exceptional quality of the beans reflects the characteristics of a unique and privileged terroir, valued by roasters and cafeterias worldwide. The contest will be a showcase for 50 samples representing the region‘s coffees, of which 22 are of the pulped natural category and 28 are of the natural category. 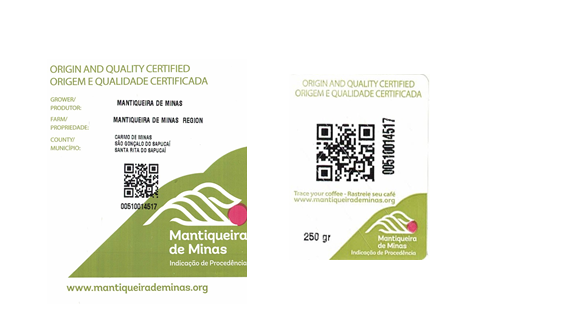 The Mantiqueira de Minas Seal of Guaranteed Origin and Quality will be presented during the contest. According to Antônio José Junqueira Villela, President of APROCAM (Association of Coffee Producers in Mantiqueira), “The contest is part of a set of initiatives of the region fostering continuous evolution of our coffee growing, generating recognition and business opportunities to producers. On its turn, our Seal of Origin and Guaranteed Quality certifies to buyers an exclusive product, produced within the demarcated area and following rules created to highlight the organoleptic characteristics found exclusively in the Mantiqueira de Minas coffees. By using this Seal, roasters share with their consumers the history of the producer and details on how the coffee was produced. This is a powerful tool that can be utilized to differentiate the coffee and aggregate value to their brands”. Growers and sellers in a region of Brazil’s Minas Gerais are organizing to promote the quality of their coffees, last week holding the first annual Mantiqueira de Minas Coffee Quality awards ceremony and introducing a related seal. In a country often associated with mass, collective production, an overarching goal of the awards program is to recognize individual producers and promote the sub-region’s coffees to specialty buyers as a differentiated product. The contest itself included more than 50 coffees in two categories: pulped natural and non-pulped natural, with 15 winners taking honors in each category. Coffee samples were numbered — without names — and sent to licensed Q-graders for judging. Professor Leandro Carlos Paiva, from the Instituto Federal de Educação, Ciência e Tecnologia do Sul de Minas (South of Minas Federal Institute of Education, Science and Technology) coordinated the technical aspects of the contest. He suggests bringing together individual cooperatives and producers for such programs is good for far more than notoriety. The coffee produced by Marisa Coli Noronha (pictured with President of BSCA, Henrique Sloper) in Sitio Sao Francisco de Assis in Carmo de Minas in the region of Mantiqueira, Minas Gerais, was elected on Friday, November 11 the best cherry peeled/pulpless in the 2013 harvest in Brazil. The definition was given by the international jury of the 14th Cup of Excellence - Early Harvest, competition held by the Brazilian Specialty Coffee Association (BSCA) in partnership with (Apex-Brazil) Brazilian Agency for the Promotion of Exports and Investments and Alliance for Coffee Excellence (ACE). After analysis of the international jury, other 31 batches were also elected winners of the main competition for quality coffee produced by wet method in the country for achieving a grade higher than 85 points, in the range of 0 (zero) to 100 of the Cup of Excellence. The top two, the coffee produced in Sertaozinho Group Fazenda Rainha, in São Sebastião da Grama, Mogiana Paulista, and the champion, achieved grades superior than 90 points and were considered presidential coffees (see the full results at the BSCA website - http :/ / bsca.com.br / cup-of-excellence.php? id = 19). New to this year's event was the election of the best coffees by growing region. Besides the champion, winner of the Mantiqueira Minas Gerais, and the vice victorious by Mogiana of São Paulo, the coffee produced by Marcos Antônio Nalli, on the site of Sertão da Baleia in Castle, was the best of the Mountains of Espírito Santo; the grain cultivated by Eduardo Pinheiro Campos, in the Farm Dona Nenem in Presidente Olegario, was the winner of the Cerrado Mineiro; the coffee from Candido Vladimir Ladeia Rosa from Ouro Verde Farm, in Piatã, was the best of the Plateau of Bahia, and the coffee group Orpheus, from Farm Sertaozinho in Botelhos, was the winner in the South of Minas Gerais. The Brazilian taster Silvio Leite, invited to a special participation in the international phase of the competition, highlights the quality of the winning coffees. "I had the opportunity to taste the top 10, which have an exceptional quality level, as well as various attributes of body and flavor, referring to chocolate, vanilla and caramel, besides having touch of citric acid / tartaric differentiated a fact that greatly impressed international judges "comments. The 32 winners of the Cup of Excellence - Early Harvest 2013 Brazil won the right to be offered in the competitive auction, by internet, the organization of the contest will do on 27 November this year. Trade in the previous competition, all the cafes were traded, generating total revenues of U.S $ 395,096.52 (R$ 802,045.94 ), at an average of U.S. $ 5.54 per pound, which amounted to U.S. $ 732.83 (* R $ 1,487.64) per bag of 60 kg, representing an increase of 270.20% over the closing of the day on the New York Stock Exchange (U.S. $ 1.4965 per pound on 10 January 2013). At the end of business, the highest bid registered was U.S.$ 12.10 per pound (up 708.55% from NY) paid by the consortium formed by Japanese companies Maruyama Coffee, Saza Coffee, 0Uchida Coffee and Coffee-a-gogo and the company Orsir Coffee from Taiwan. This amount represented U.S. $ 1,600.59 ( R $ 3,249.20) paid by each of the 17 bags of Fazenda do Moinho, located in Olympio Noronha (MG). The plot yielded a total of U$ 27,209.45 (R$ 55,235.18) producer Vinicius Jose Carneiro Pereira winner of catering exclusively to Brazilian coffees produced by wet (peeled or pulped cherries) in the 2012. The 2013 edition of the Cup of Excellence - Early Harvest is sponsored by the Brazilian Service of Support for Micro and Small Enterprises (Sebrae) audited by the Centre Coffee Trade of the State of Minas Gerais (CCCMG) and has the institutional support of the Brazilian Association of Coffee Industry (Abic) and the Association of Coffee Producing Mantiqueira (Aprocam) of CarmoCoffees of the Confederation of Agriculture and Livestock of Brazil (CNA) of the Council of Coffee Exporters of Brazil (CeCafé) and the National Council Coffee (CNC). *Dollar quoted at R $ 2.030 at the close of 10/01/2013. Quando se avista as montanhas na Serra da Mantiqueira, no Sul de Minas Gerais, vê-se com facilidade as plantações seculares de café, a uma altitude de mais de 1.100 metros. Lá, onde a máquina não vai, a colheita é feita à mão, o que impacta em 60% o custo da produção, diz o presidente da Cooperativa Regional dos Cafeicultores do Vale do Rio Verde (Cocarive), Ralph Junqueira. Por isso, a opção pelo café especial, que remunera melhor, tem aumentado na região na última década. Enquanto o preço pago ao produtor por uma saca de café especial vai de R$ 400 a R$ 800, o café commodity vale R$ 290. Mas ainda tem muito espaço para crescer. Das 200 mil sacas de 600 produtores de café de 18 municípios que a Cocarive vai receber nesta safra, 20% a 30% é formada por café especial e o restante pelo café commodity. Com 150 mil sacas de 500 produtores, o vice-presidente da Cooperativa Agropecuária do Vale do Sapucaí (Coopervass), Leonardo Brandão, diz que o café especial está estimulando o produtor a permanecer na atividade cafeeira. Há oito anos, Pedro Ferraz, da Fazenda Junqueira Reis, em Carmo de Minas, investiu em renovação de lavouras de cafés mais finos. Agora, ele tem até 30% da produção de mil sacas no café especial onde consegue R$ 600 pela saca. “Quero chegar a mais de 50% no café especial”. José Wagner Junqueira, 74, produtor há mais de 50 anos na fazenda Serra das Três Barras, também em Carmo de Minas, tem mais de 50% das 1.200 sacas em café especial. “Se não fosse isso, eu já tinha acabado com a fazenda”. Com 200 mil pés de café, Otaviano Ribeiro mostra orgulhoso as três posições conquistadas entre os dez primeiros lugares no concurso de qualidade do Brasil da Associação Brasileira de Cafés Especiais (BSCA sigla em inglês), em 2011. A colheita deste ano será de 2.100 sacas na fazenda Granja São Francisco, em Carmo de Minas, que está com a família desde 1937. “Vou descascar 60% (1.260 sacos) e o restante, 40%, será o café commodity”, calcula para os 50 hectares de plantação. Tudo começou com os bisavós Pedro e Cornélia, passou para o avô Luciano, foi para o pai Maurício até chegar ao filho Luiz Flávio de Castro, 43, que tem cem mil pés de café e produz até 700 sacas por safra no Sítio Colinas, em Carmo de Minas. Do total, até 40% da safra são das variedades bourbon amarelo, catuaí amarelo e acaiá, todos cafés especiais. “A saída é a qualidade”, diz Castro, que optou pela produção dos especiais a partir de 2000. Em 2011, alcançou o primeiro lugar do concurso da Associação Brasileira de Cafés Especiais (BSCA). O presidente do conselho da Aprocam, Gláucio Carneiro, diz que o mercado consumidor dos especiais está nos Estados Unidos, Japão e Europa. “Queremos que a região da Mantiqueira seja conhecida internacionalmente como produtora de cafés especiais”. Quando começou o trabalho do Sebrae-MG com os cafeicultores da Mantiqueira de Minas? Foi em 2010. A ideia é trabalhar a união das entidades para ter estratégia de uma marca no território, priorizando a divulgação dos critérios que a região possui para que o mercado tenha percepção diferenciada do café. Mas o que o Sebrae-MG quer que o mercado veja? A entidade quer que vejam tradição e vanguarda na produção de cafés raros e surpreendentes. Tradição, por ser uma produção secular, e vanguarda, por mostrar o cuidado no fazer o café que os produtores têm no tocante à colheita e às técnicas para obter um produto de qualidade. E quanto custa esse um investimento? Todo o trabalho do Sebrae-MG é rateado entre os parceiros (com as cooperativas Cooperrita, Coopervass e Cocarive) e 30% do custo do projeto é repassado pela cooperativa para o Sebrae. Pensando em orientar o cafeicultor na condução de seu negócio, uma das maiores autoridades do mundo em cafés especiais, o professor e pesquisador do Departamento de Engenharia da Universidade Federal de Lavras (UFLA), Flavio Meira Borém, destacou alguns pontos fundamentais de gestão, principalmente em momentos de crise. Segundo ele, os produtores que, no início da safra, optaram pela qualidade da bebida não podem perder o foco, devem buscar o mercado correto para o café especial e, assim, ser remunerado justamente por ele. Borém destacou a importância da visão de empreendedorismo nestes tempos de crise. “O produtor precisa entender que qualidade sempre acrescenta vantagens, nunca subtrai. Fazer café com qualidade não significa ter um custo mais elevado, pelo menos até o armazenamento. O processamento e a secagem é simplesmente fazer bem feito, colher na hora certa, processar da maneira correta para evitar que o café estrague. Não estou falando de melhorar de riado para duro. Estou falando de cafés finos, suaves. Faz toda a diferença nestes tempos de crise. Qualquer porcentagem da produção reservada como especial fará o valor médio da saca subir”, explicou o professor. Já para os produtores de café commodity, Borém alerta que eles precisam estar atentos às tendências do mercado e dialogar com consultores. Para ele, a gestão de estratégias de mercado está totalmente alinhada com a qualidade e saber fazer essa gestão correta é fundamental, já que muitos fecham negócio rapidamente e não trabalham com outras alternativas, como o mercado futuro e demais modalidades. O cafeicultor pode procurar entidades como o Centro de Inteligência em Mercados (CIM), que funciona no Departamento de Administração e Economia da UFLA, e que podem fornecer informações sobre as tendências de mercado, tanto interno quanto externo. Outro aspecto importante para os cafés especiais é o armazenamento. O especialista recomenda que ao se identificar um lote especial de café já beneficiado, o produtor deve imediatamente retirá-lo do saco de juta e coloca-lo em embalagens a vácuo, impermeáveis ou em câmaras refrigeradas. No entanto, se ele estiver em pergaminho ou em coco, o cafeicultor deve mantê-lo assim por trinta dias e beneficiá-lo somente após o fechamento da venda. “Quando o café especial é armazenado em sacos de juta, em 30 dias ele já alterou completamente seu sabor e aroma. Em três meses já é desclassificado como especial, principalmente por oxidação e por rancificação”, disse Borém. O docente alertou também para os produtores que secam excessivamente o café. Ao invés de finalizarem a secagem com 11% de umidade, a grande parte está secando com até 9%. Porém, o pesquisador diz que não se deve nunca umedecer o café posteriormente. Flavio Borém comentou ainda o anúncio feito pela Associação Americana de Cafés Especiais, que o elegeu como integrante do Comitê de Normas Técnicas. “A minha expectativa é poder colaborar nesse comitê como um pesquisador e professor, dar suporte ao comitê no desenvolvimento de pesquisas na UFLA, oferecendo colaboração concreta para pesquisar e gerar padrões com sustentação cientifica. Além de ser uma voz que vai lembrá-los dos naturais especiais. É fundamental rever os critérios de classificação dos naturais especiais”, explicou Borém. A multiplicação de cafeterias no Brasil contribui para um novo hábito: degustar café fora de casa em estabelecimentos especializados. Hoje praticamente todas as regiões cafeeiras do Brasil produzem grãos especiais, como Cerrado, Zona da Mata e Sul de Minas Gerais, Serra do Espírito Santo, Bahia, São Paulo e Paraná. Mas, em se tratando de cafés especiais, Minas Gerais ganha destaque com cerca de 65% da produção brasileira. “Que o Brasil há muitos anos produz cafés de qualidade excepcional e variada não é novidade, inclusive pela sua diversidade de climas, altitudes e tipos de solo. O fato novo é que o nosso País tem conseguido galgar cada vez mais mercado, impulsionado pelo crescente movimento rumo à diferenciação do produto, devido às novas exigências do mercado externo e interno. Essa tendência é irreversível e cresce em ritmo acelerado, trazendo novas oportunidades de negócios no País e no exterior”, diz o professor Flávio Borém, da Universidade Federal de Lavras – Ufla, instituição participante do Consórcio Pesquisa Café, cujo programa de pesquisa é coordenado pela Embrapa Café. Premiação - Um exemplo dessa mudança no mercado foi o leilão de lotes de cafés premiados pelo 2º Concurso de Qualidade Cup of Excellence Natural Late Harvest, realizado em março deste ano pela Associação Brasileira de Cafés Especiais (BSCA) em Minas Gerais que gerou faturamento de US$ 401 mil. O preço médio da saca de 60 quilos alcançou R$ 1,64 mil, valor bem superior aos R$ 320 pagos pelo mesmo volume do grão arábica comum, o que deve incentivar cada vez mais investimentos na melhoria do café produzido em Minas e em outros estados. O produtor Arthur Queiroz, da Fazenda Santa Quitéria, em Cambuquira (MG), foi um dos participantes do concurso da BSCA. Dos cinco lotes de café que inscreveu, três deles chegaram à fase internacional. Arthur prevê que três quartos da produção dessa safra seja de cafés especiais. Ricardo Iabrudi, de Três Corações (MG), também é referência na produção de cafés especiais. Ele venceu o Concurso da Cooperativa dos Cafeicultores da Zona de Varginha - Minasul na categoria Cereja Descascado e foi 3º colocado na categoria Café Natural. A Minasul mandou este ano para Portland, em Nova Jersey, Estados Unidos, mais de 600 sacas de café dos finalistas do 20º Concurso Qualidade Minasul de Café na categoria Cereja Descascado e Café Natural, realizado em 2012. Muitos outros exemplos poderiam ser citados. É o caso de Jesimar de Oliveira Sandi, proprietário do Sítio São Joaquim, no município de Conceição das Pedras, região Sul de Minas Gerais, que produziu o melhor café natural do Brasil na safra 2012, sagrando-se campeão do 2º Concurso de Qualidade Cafés do Brasil Cup of Excellence Natural Late Harvest com a nota 92,13 pontos (escala de 0 a 100). A segunda e a terceira posições ficaram, respectivamente, com os cafés de Amauri Dias de Castro, da Fazenda São José, localizada na cidade de Jesuânia (MG), com a nota 90,30, e José Flávio Ferraz Reis, proprietário da Fazenda JR (Junqueira Reis), em Carmo de Minas (MG), com 90,20 pontos, segundo a avaliação do júri internacional do concurso. A maioria das propriedades premiadas se localizam no Sul de Minas, em altitudes superiores a 1000 metros. O engenheiro agrônomo da Minasul Adriano Rabelo explica que o plantio é feito de novembro a fevereiro e a colheita é realizada de maio a setembro. O processamento é feito por via úmida, no caso do café cereja descascado, e por via seca, no caso do café natural. O café é colhido, lavado e pode ser descascado ou não. Logo em seguida, vai para o terreiro, onde é feita a meia seca, antes de ir para o secador (a 11 % de umidade). O café fica pelo menos dez dias nas tulhas de descanso para depois ser enviado aos armazéns das cooperativas. Tecnologias a serviço da qualidade - Na busca de qualidade, existem regras fundamentais a serem observadas. Em 2012, o professor Flávio Borém ministrou curso intensivo para produtores sobre colheita e processamento. Flávio ensina que, para produzir cafés especiais, é importante colher e processar os frutos de acordo com a cultivar e com as condições ambientais de cultivo. “Além disso, de acordo com resultados recentes de estudos do Consórcio Pesquisa Café, concluímos que, na hora da secagem, os limites de temperatura e a taxa de secagem precisam ser respeitados, principalmente na produção de cafés naturais especiais”, observou o professor. A adubação fosfatada é outra tecnologia amplamente difundida na região e que foi desenvolvida pela Embrapa Cerrados, instituição participante do Consórcio Pesquisa Café. A técnica é, em geral, utilizada em conjunto com a irrigação e contribui para expressivo aumento de produtividade, mais energia, vigor e sanidade das plantas. A adição do fósforo traz benefícios para a planta tanto em solos de média a alta fertilidade como também em solos de baixa fertilidade, como os do Cerrado, onde a planta responde com grande intensidade. Há ainda disponível para o mercado tecnologias para preparo, secagem e armazenamento de grãos, desenvolvidas pela Universidade Federal de Viçosa – UFV, instituição co-fundadora e participante do Consórcio. São alternativas tecnológicas especialmente desenvolvidas para oferecer, a custos compatíveis, uma infraestrutura mínima para que, independentemente das condições climáticas, o cafeicultor possa produzir café de qualidade superior, com economia de tempo, redução de custos e mão de obra empregada e maior rendimento operacional. É composta por um terreiro-secador híbrido, abanadora, silo secador e lavador portátil (clique aqui para mais informações). Também destacam-se o sensoriamento remoto e os sistemas de informação geográfica, usados em apoio à produção ou à qualidade do café para auxiliar na caracterização ambiental dos agroecossistemas cafeeiros e fornecer uma base eficiente para a análise integrada das informações e o entendimento das relações entre os sistemas de produção e o ambiente, incluindo simulação de prognósticos. Pela análise espacial, é possível delimitar territórios e identificar, por exemplo, os fatores que influenciam a qualidade dos cafés produzidos nessas regiões, informação imprescindível para a obtenção de Indicações Geográficas - IGs. As geotecnologias são estudadas no âmbito do Consórcio pela Empresa de Pesquisa Agropecuária de Minas Gerais – Epamig, Embrapa Café e Ufla e têm subsidiado o planejamento da atividade cafeeira visando competitividade e sustentabilidade da produção. Requisitos e identificação – Segundo Borém, é possível encontrar várias definições para café especial, refletindo muitas vezes os efeitos da cultura, costumes e valores de cada povo, região ou país e estando associado ao prazer que a bebida proporciona. “O café especial é aquele que se distingue por uma característica peculiar ou grupo de atributos singulares, possuindo, portanto, uma especialidade ou especificidade na percepção de seus atributos sensoriais e de seu sistema de produção. O café pode ser especial por possuir sabor e aroma únicos e distintos do café comum, por ser produzido em sistema orgânico, ser de origem controlada ou até mesmo por ser raro e exótico”, explica. O professor esclarece que, mesmo sendo os aspectos sensoriais os mais relevantes na caracterização de um café especial, os atributos ambientais e sociais cada vez mais influenciam na caracterização do produto. “Nesse caso, como o atributo não é percebido sensorialmente, a diferenciação é obtida por meio de certificações de origem e uso de selos de garantia”, completa. O café que chega à mesa do consumidor, para ser considerado especial, passa por um longo processo que começa nos aspectos genéticos, no sistema de produção e manejo da lavoura (plantio, boas práticas na lavoura e colheita), pelo processamento pós - colheita (secagem, armazenamento), rastreabilidade do produto, ainda pela fase de industrialização (torração, moagem, embalagem) e só termina na forma de preparo da bebida. Em resumo, para ser reconhecido como especial, o café deve ter atributos específicos associados ao produto (características físicas - como origens, variedades, cor e tamanho – e sensoriais, como qualidade da bebida), ao processo de produção ou ao serviço a ele associado (como as condições de trabalho da mão de obra), tendo como valores a sustentabilidade econômica, social e a ambiental. A especialidade ou especificidade da bebida é influenciada pela região em que é produzido o café, pelas condições climáticas durante a maturação e colheita, além dos cuidados nas fases de colheita e preparo do produto. café fair trade – consumido, em geral, em países desenvolvidos por clientela preocupada com as condições socioambientais em que o café é cultivado. O consumidor paga mais pelo café produzido por pequenos agricultores ou sistemas de produção sombreados, onde a cultura é associada à floresta. É muito empregado na produção de cafés especiais, pois favorece a preservação de espécies vegetais e animais nativos. Potencial de crescimento – O café especial, pela melhoria da qualidade, tem tido crescimento do consumo no País e no exterior porque tem agradado mais os apreciadores da bebida. Parcela crescente da população, inclusive no Brasil, tem optado por esse produto diferenciado e a nossa indústria tem buscado atender esse consumidor mais exigente. “Marcas consolidadas no mercado de cafés ‘tradicionais’ já estão oferecendo cafés de origens brasileiras, de sabores e aromas superiores aos que tradicionalmente são oferecidos no mercado. O nicho dos especiais é o que mais cresce no Brasil e no mundo comparativamente ao mercado dos cafés comuns. Mesmo assim, a maior parte da produção de cafés especiais brasileiros ainda é exportada. Temos um grande caminho a percorrer para que os cafés especiais se consolidem no País”, informa Borém. Mercado - Segundo dados da BSCA, a demanda pelos grãos especiais cresce em torno de 15% ao ano, principalmente no exterior, em relação ao crescimento de cerca de 2% do café commodity. O segmento representa hoje cerca de 12% do mercado internacional da bebida. O valor de venda atual para alguns cafés diferenciados tem um sobrepreço que varia entre 30% e 40% a mais do que o café cultivado de modo convencional. Em alguns casos, pode ultrapassar a barreira dos 100%. Os principais mercados consumidores dos cafés especiais brasileiros são, na ordem, Japão, Estados Unidos e União Europeia, havendo crescimento muito grande por parte da Coreia e Austrália. No que diz respeito ao consumo interno, das 20 milhões de sacas, estima-se que um milhão é de cafés especiais. Consórcio Pesquisa Café - Congrega instituições de pesquisa, ensino e extensão localizadas nas principais regiões produtoras do País. Seu modelo de gestão incentiva a interação das instituições e a otimização de recursos humanos, físicos, financeiros e materiais. Foi criado por dez instituições: Empresa Baiana de Desenvolvimento Agrícola - EBDA, Empresa Brasileira de Pesquisa Agropecuária - Embrapa, Empresa de Pesquisa Agropecuária de Minas Gerais - Epamig, Instituto Agronômico - IAC, Instituto Agronômico do Paraná - Iapar, Instituto Capixaba de Pesquisa, Assistência Técnica e Extensão Rural - Incaper, Ministério da Agricultura, Pecuária e Abastecimento - Mapa, Empresa de Pesquisa Agropecuária do Estado do Rio de Janeiro - Pesagro-Rio, Universidade Federal de Lavras - Ufla e Universidade Federal de Viçosa - UFV. A matéria é da Gerência de Transferência de Tecnologia da Embrapa Café, texto de Carolina Costa e Flávia Bessa, com informações da BSCA, Apex Brasil: e Cooperativa Minasul, adaptada pelo CaféPoint. Ocorreu em São Paulo-SP, entre os dia 25 e 27 de março, competições que reuniram cerca de 50 baristas de todo o País nas disputas pelos títulos brasileiros de melhor barista, nas categorias de preparo de café coado, latte art, coffee in good spirits, e melhor degustador em cup taster, além de uma vaga para os mundiais, que serão realizados na Austrália, em maio, e na França, em junho. O evento, que visa estimular e promover a profissão de barista e de degustadores de café, foi realizado pela Associação Brasileira de Café e Barista (ACBB), em parceria com a CIPA-Fiera Milano, empresa responsável pela realização da primeira edição da Food & Hospitality, no Transamérica Expo Center, local sede das provas. Um dos destaques dessa edição foi o vencedor de Cooffe in Good Spirits, Hugo Silva, do Octávio Café, que em sua primeira participação em campeonatos saiu como campeão. Assim como ele, outros baristas novatos também se destacaram, como Erick Brito, terceiro lugar em Latte Art, e Amanda Maires, terceiro lugar de preparo de café coado. Já os veteranos, entraram nas provas para superarem seus próprios recordes, como Wellington Pereira, que conquistou seu bicampeonato de cup tasterscom foco em buscar o título mundial não conquistado no ano passado. Em maio e junho a ACBB levará os campeões para as provas dos campeonatos internacionais. A associação acredita que os resultados serão muito positivos. “Ficamos muito felizes com o alto nível dos candidatos em todas as provas. Isso, para nós, mostra que estamos no caminho certo. Temos cada vez mais participantes com qualidade, com grandes chances de vencerem nos mundiais”, declara Katia Alves, presidente da ACBB. Com apenas 21 anos de idade, a curitibana Carolina Franco, do Lucca Cafés Especiais, acumula nove anos de experiência em campeonatos nacionais e internacionais e vários títulos. No evento desta semana, Carolina levou o troféu do 2º Campeonato Brasileiro de Preparo de Café e, com isso, ganhou a chance de representar o Brasil no mundial da categoria, em Melbourne, na Austrália, em maio deste ano. A prova abriu as competições, no dia 25/03, com a participação de oito baristas que prepararam cafés pelo método filtrado e manual. Os competidores tiveram 10 minutos para a apresentação da escolha e preparo de três cafés para três juízes, que avaliaram aroma, sabor, gosto final, acidez, corpo e balanço do café (70% da nota). Foram julgados também quesitos como descrição do sabor, serviço ao cliente e impressão geral (30%). "Usei um café do seu José Meneghetti, que tem uma microprodução de café no Espírito Santo, mas com um produto de altíssima qualidade. Foi um dos cafés mais diferentes que já experimentei e tinha que usar na minha apresentação”, conta Carolina. Para atingir o sabor desejado, Carolina diz que usou duas moagens diferentes, trouxe água mineral da Serra da Graciosa (PR), e usou um kalita para filtrar o café “O kalitapermite uma filtragem mais regular, fazendo com que a água passe por todo o café ao mesmo tempo”, explica a barista. Graciele Rodrigues, representante do Lucca Cafés Especias, de Curitiba, foi um dos grandes destaques do evento. Ela recebeu o título de bicampeã brasileira de latte art, ao encantar os juízes e ao público com sua técnica e criatividade. A barista é a atual vice-campeã mundial de latte art e também a atual campeã brasileira de barista. Só neste semestre, ela vai disputar o World Barista Championship, em maio na Austrália, e o World Latte Art Championship, em junho na França. Os seis competidores participantes tiveram que preparar quatro bebidas, sendo dois cafés latte idênticos e dois cafés com leite de assinatura. Nos dois primeiros, Graciele fez uma tulipa, com uma roseta invertida, e no segundo, um gato brincando com uma bola azul, o que foi a sensação para o público. Precisão dos traços e a técnica de preparo chamou a atenção dos juízes. “Usei um duplo de espresso para melhor contrastar com a espuma e destacar mais os traços do desenho. Para a bola do gato, coloquei um pouco de corante azul na espuma”, diz Graciele. A barista, que já vinha com treinos de três horas, quatro vezes por semana para o Mundial de Barista, vai se dedicar ainda mais para o de latte art, que acontece no mês seguinte. “Sei que o número de participantes nos mundiais é bem maior que no brasileiro, mas tenho me dedicado bastante e espero surpreender a todos com a minha apresentação”, afirma a ela. Barista do Octávio Café, o paulistano Hugo Santos, estreou no campeonato e levou o título brasileiro de coffee in good spirits. Ele irá para Nice, na França, em junho para concorrer ao título mundial. Os 10 participantes tiveram oito minutos para preparar dois irish coffees (bebida com uísque, café coado, creme e açúcar) e um drinque de assinatura. Com um dos melhores tempos de apresentação, Silva conquistou os juízes com a originalidade de seu drinque montado, usando café, uísque, caramelo, espuma de manga com limão siciliano, sorvete de creme e pimenta tabasco. “Eu nunca participei de nenhum campeonato e nem imaginava conquistar o primeiro lugar. Treinei muito durante um mês, cerca de seis a sete horas por dia e pretendo me preparar mais ainda para o mundial”, diz o campeão. A última competição do dia, o 5º Campeonato Brasileiro de Cup Tasters, foi destinada aos provadores e classificadores profissionais que passam por uma prova de avaliação sensorial do café. A competição consiste em oito testes triangulares: de três xícaras, duas trazem o mesmo café, e o competidor deve identificar a xícara com o café diferente em menos tempo. Wellington Carlos Pereira, representante da Cocarive - Cooperativa Regional dos Cafeicultores do Vale do Rio Verde, superou o tempo de todos os demais concorrentes na final, com uma diferença de dois minutos do segundo colocado. "Quando vou para uma prova, vou sempre bem preparado e confiante da vitória. Acho que isso ajuda bastante", admitiu o degustador, que trabalha com café há 12 anos. Pereira agora terá como próximo desafio disputar a final mundial da categoria Cup Tasters, na França. “Competi no ano passado, em Viena, e não gostei do meu desempenho, porque foi o primeiro mundial. Neste ano, vou treinar com o café que errei na competição passada e vou confiante para ser campeão” afirma Pereira. 1º Carolina Franco, Lucca Cafés Especiais de Curitiba. A matéria é da organização do evento, adaptada pelo CaféPoint. A APROCAM Associação dos Produtores de Café da Mantiqueira , realizou no dia 07 de março um grande encontro em Carmo de Minas, o qual foi marcado pela presença de várias autoridades como o Prefeito Municipal Sr. Guy Junqueira Villela, o presidente da APROCAM Sr. Antônio José Junqueira Villela, o Diretor do Departamento de Café da COOPERRITA Sr. Roberto Mendes, Diretor Administrativo da COCARIVE Sr. Gláucio Carneiro Pinto, Diretor Secretário do Sindicato dos Produtores Rurais de Carmo de Minas Sr. Luiz Eduardo Guerra de Castro, representante do INPI Sr. Luiz Claudio Dupin, Presidente do Sindicato dos Produtores Rurais de Santa Rita do Sapucaí Sr. Leonilton Moreira, Diretor Presidente da COOPERVASS Sr. Paulo Roberto Vilela Silva, representantes do MAPA Srs. Pedro Lúcio Junqueira Pereira e André Vieira de Assis, Coordenador do Projeto IG – Mantiqueira de Minas – UFLA, representante da EMATER, Sr. Alexandre Kurachi, Sr. Sebastião Celso Carneiro Garcia, representante do IMA, além dos produtores dos municípios que integram a microrregião da Mantiqueira de Minas. Organizado pela APROCAM, COCARIVE, COOPERRITA, COOPERVASS e Sindicato dos Produtores Rurais de Carmo de Minas e Santa Rita do Sapucaí, o evento contou ainda com diversas palestras. A palestra “Indicação Geográfica” foi ministrada pela Sra. Hulda Oliveira Giesbrecht, representante do SEBRAE. A Indicação Geográfica constitui um direito de propriedade intelectual autônomo, a exemplo de uma patente ou de uma marca. São signos que indicam aos consumidores que serviços e produtos possuem características especiais relacionadas com o lugar de procedência, tendo como o objetivo criar valor local, sendo uma ferramenta de desenvolvimento e promoção regional. A palestra “Projeto IG Mantiqueira de Minas”, apresentada por Margarete Marin Lordelo Volpato, Tatiana Grossi Chquiloff Vieira e Dr. Flávio Meira Borem. O Projeto IG Mantiqueira de Minas apresentado em março de 2011, coordenado pelo prof. Flávio Meira, teve como principal objetivo caracterizar a microrregião da Serra da Mantiqueira e estudar o potencial que a região tem para ser feita a solicitação de Denominação de Origem. Fazem parte desse projeto os municípios de Baependi- Brazópolis, Cachoeira de Minas, Cambuquira, Campanha, Carmo de Minas, Caxambu, Conceição das Pedras, Conceição do Rio Verde, Cristina, Dom Viçoso, Heliodora, Jesuânia, Lambari, Natércia, Olimpio Noronha, Paraisópolis, Pedralva, Piranguinho, Pouso Alto, Santa Rita do Sapucaí, São Gonçalo do Sapucaí, São Sebastião da Bela Vista, São Lourenço e Soledade de Minas. 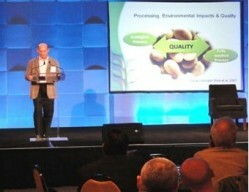 "Cup of Excellence Natural Late Harvest" gerou faturamento de US$ 401 mil. O leilão dos 22 lotes de cafés premiados pelo 2º Concurso de Qualidade "Cup of Excellence Natural Late Harvest", realizado pela Associação Brasileira de Cafés Especiais (BSCA), na última semana, gerou faturamento de US$ 401 mil. Com o resultado, o preço médio pago pela saca de 60 quilos alcançou R$ 1,64 mil, valor muito superior aos R$ 320 pagos pelo mesmo volume do grão arábica comum. A supervalorização deve incentivar os investimentos na melhoria do café produzido no Estado. A segunda edição do premio da BSCA foi realizada em parceria com a Agência Brasileira de Promoção de Exportações e Investimentos (Apex-Brasil) e com a Alliance for Coffee Excellence (ACE). De acordo com os dados da BSCA, todos os 22 lotes de cafés foram negociados e geraram receita total na ordem de US$ 401,8 mil ou R$ 793,6 mil, o que significou um valor médio de US$ 6,31 por libra peso, correspondendo a US$ 834,69 ou R$ 1,64 mil por saca de 60 quilos. O valor médio pago pela saca dos cafés especiais representou uma alta de 451,84% sobre os valores registrados no fechamento na Bolsa de Nova York, US$ 1,39 por libra peso, no contrato com vencimento em maio de 2013. Ainda conforme os dados da associação, o maior lance registrado foi de US$ 18,80 por libra peso, alta de 1.346,22% ante Nova York, pago pela empresa UCC Ueshima Coffee Co.Ltd, do Japão. Esse valor equivale a US$ 2,48 mil ou R$ 4,91 mil pagos por cada uma das 21 sacas do Sítio São Joaquim, situado em Conceição das Pedras, no Sul de Minas Gerais. O lote rendeu um total de US$ 52,226 mil ou R$ 103,14 mil ao produtor Jesimar de Oliveira Sandi, vencedor do concurso destinado exclusivamente aos cafés naturais do Brasil. De acordo com a diretora executiva da BSCA, Vanúsia Nogueira, os preços altos pagos pelo café do produtor mineiro já eram esperados, uma vez que o café é uma novidade no mercado. "O vencedor da edição atual do prêemio da BSCA nunca tinha participado de nenhum outro concurso e a região também foi novidade. Este diferencial chama a atenção dos compradores, que acabam pagando mais pela qualidade e inovação", disse. Vencedor - Para o produtor Jesimar de Oliveira Sandi, tanto a conquista do prêmio "Cup of Excellence Natural Late Harvest", como o valor recorde pago pelas sacas do lote premiado foram grandes surpresas. "Cultivamos o café há muito anos, mas nunca tínhamos participado de concursos de qualidade. Fomos surpreendidos e, a partir de agora, vamos nos inscrever em outras premiações. Estamos muitos felizes pelo reconhecimento da qualidade do nosso café e pelos valores pagos pelo lote premiado", disse Sandi. A produção do Sítio São Joaquim, em 2012, foi de mil sacas de 60 quilos de café e para este ano deverá ter um pequeno incremento. Após os resultados do concurso, a saca do café produzido na propriedade passou a ser negociada em torno de R$ 520, sendo que nas demais propriedades produtoras os preços do mesmo volume giram em torno de R$ 320. "Nosso objetivo é continuar a investir na melhoria dos tratos culturais e na renovação. Com isso esperamos ampliar ainda mais a qualidade do grão. Este investimento é muito importante e tem retorno, já que os cafés especiais possuem maior valor agregado e grande demanda", disse. Ainda segundo Sandi, toda a produção de 2012 já foi negociada. O café terá como destino o mercado internacional. No município de Conceição das Pedras, vários outros produtores estão investindo na melhoria dos tratos e também têm a intenção de participar de concursos de qualidade. O leilão dos 22 lotes vencedores do 2º Concurso de Qualidade 'Cup of Excellence Natural Late Harvest' - Edição 2012, realizado pela Associação Brasileira de Cafés Especiais (BSCA, sigla em inglês), em parceria com a Agência Brasileira de Promoção de Exportações e Investimentos (Apex-Brasil) e com a Alliance for Coffee Excellence (ACE), ocorreu nesta quinta-feira, dia 14 de março, por intermédio da internet. Todos os cafés foram negociados e geraram uma receita total na ordem de US$ 401.870,23 (* R$ 793.693,70), a uma média de US$ 6,31 por libra peso, o que corresponde a US$ 834,69 (* R$ 1.648,51) por saca de 60 kg e representa alta de 451,84% sobre o fechamento do dia na Bolsa de Nova York (US$ 1,3965 por libra peso no contrato com vencimento em maio de 2013, o mais negociado). Ao término dos negócios, o maior lance registrado foi de US$ 18,80 por libra peso (alta de 1.346,22% ante Nova York), pago pela empresa UCC Ueshima Coffee Co.,Ltd, do Japão. Esse valor equivale a US$ 2.486,97 (* R$ 4.911,77) pagos por cada uma das 21 sacas do Sítio São Joaquim, situado em Conceição das Pedras (MG), Sul de Minas Gerais. O lote rendeu um total de US$ 52.226,40 (* R$ 103.147,14) ao produtor Jesimar de Oliveira Sandi, vencedor do concurso destinado exclusivamente aos cafés naturais do Brasil. De acordo com a diretora executiva da BSCA, Vanusia Nogueira, apesar do momento desfavorável no mercado, o resultado do leilão foi bom em função da qualidade superior dos lotes ofertados. "Em anos de crise nos preços do café, os grãos especiais se sobressaem pela qualidade diferenciada e, neste ano, o fator novidade também contribuiu", conta. “A novidade foi exatamente o lote do cafeicultor Jesimar de Oliveira Sandi. Sua produção e seu município nunca haviam sido representados em nenhum concurso de qualidade, o que aliou a curiosidade à qualidade desse café e gerou um excelente lance no leilão”, completa. O segundo melhor valor do pregão foi pago para os grãos produzidos por José Flávio Ferraz Reis, proprietário da Fazenda JR (Junqueira Reis), em Carmo de Minas (MG). Seu lote, de 19 sacas, foi arrematado pela também japonesa Time´s Club, que pagou US$ 2.182,34 (* R$ 4.310,12) por saca, gerando um total de US$ 41.464,50 (* R$ 81.892,39). O resultado completo do leilão pode ser acessado no site da ACE (http://www.allianceforcoffeeexcellence.org/en/auctions/2013-brazil-late-harvest). O principal concurso de qualidade destinado exclusivamente aos cafés naturais (colhidos e secos com casca) no Brasil conta com o apoio institucional da Associação Brasileira de Indústria de Café (Abic), do Conselho dos Exportadores de Café do Brasil (CeCafé), do Conselho Nacional do Café (CNC) e da Cooperativa dos Cafeicultores da Zona de Varginha (Minasul), além do patrocínio do Serviço Brasileiro de Apoio às Micro e Pequenas Empresas (SEBRAE). A auditoria foi responsabilidade do Centro do Comércio de Café do Estado de Minas Gerais (CCCMG). * Dólar cotado a R$ 1,975, conforme fechamento de 14/03/2013. Aconteceu no dia 07 de março, um grande encontro promovido pela APROCAM em Carmo de Minas o qual foi marcado pela presença do Exmo. Sr. Prefeito Municipal, Sr. Guy Junqueira Villela, o qual compôs a mesa juntamente com o Presidente da APROCAM, Sr. Antônio José Junqueira Villela, representante do SEBRAE, Sra. Hulda Oliveira Giesbrecht, Diretor do Departamento de Café da COOPERRITA, Sr. Roberto Mendes, Diretor Administrativo da COCARIVE, Sr. Gláucio Carneiro Pinto , Diretor Secretário do Sindicato dos Produtores Rurais de Carmo de Minas, Sr. Luiz Eduardo Guerra de Castro, Representante do INPI, Sr. Luiz Claudio Dupin, Presidente do Sindicato dos Produtores Rurais de Santa Rita do Sapucaí, Sr. Leonilton Moreira , Diretor Presidente da COOPERVASS, Sr. Paulo Roberto Vilela Silva , representante do MAPA , Srs., Pedro Lúcio Junqueira Pereira e André Vieira de Assis, Dr. Flavio Meira Borem, Coordenador do Projeto IG – Mantiqueira de Minas – UFLA, representante da EMATER, Sr. Alexandre Kurachi, Sr. Sebastião Celso Carneiro Garcia, representante do IMA. Também presentes no evento, produtores dos municípios que integram a microrregião da Mantiqueira de Minas. Organizado pela APROCAM, COCARIVE, COOPERRITA. COOPERVASS, SINDICATO DOS PRODUTORES RURAIS DE CARMO DE MINAS E SANTA RITA DO SAPUCAÍ, o evento contou ainda com as palestras “ INDICAÇÃO GEOGRÁFICA” – com a Sra. Hulda Oliveira Giesbrecht,” PROJETO IG MANTIQUEIRA DE MINAS” – com Margarete Marin Lordelo Volpato e Tatiana Grossi Chquiloff Vieira e Dr. Dr. Flávio Meira Borem . Baependi- Brazópolis, Cachoeira de Minas, Cambuquira, Campanha, Carmo de Minas, Caxambu, Conceição das Pedras, Conceição do Rio Verde, Cristina, Dom Viçoso, Heliodora, Jesuânia, Lambari, Natércia, Olimpio Noronha, Paraisópolis, Pedralva, Piranguinho, Pouso Alto, Santa Rita do Sapucaí, São Gonçalo do Sapucaí, São Sebastião da Bela Vista, São Lourenço e Soledade de Minas. Os Organizadores agradecem a todos que compareceram e principalmente às parcerias estratégicas realizadas durante o processo de Indicação Geográfica, entre elas: SEBRAE – MG E NACIONAL, BANCO DO BRASIL, CNPQ, EMATER, EMBRAPA CAFÉ, EPAMIG, FAEMG, IAC, IMA, INPI,UNB,UFLA,PREFEITURA MUNICIPAL DE CARMO DE MINAS E MAPA. A Indicação Geográfica – IG constitui um direito de propriedade intelectual autônomo, a exemplo de uma patente ou de uma marca. São signos que indicam aos consumidores que serviços e produtos possuem características especiais relacionadas com o lugar de procedência. A Indicação Geográfica tem como objetivo criar valor local, sendo uma ferramenta de desenvolvimento e promoção regional. A crescente falsificação e a utilização indevida dos nomes geográficos por produtores fora das regiões que adquiriramnotoriedade levaram a necessidade da criação de mecanismos de proteção a este ativo intelectual coletivo –importante: proteção da região de produção. • A Indicação de Procedência é o nome geográfico de um país, cidade, região ou localidade que se tornou conhecido como centro de produção, fabricação ou extração de determinado produto ou prestação de um serviço específico. O que caracteriza uma Indicação de Procedência é a Notoriedade – reputação da localidade onde se produz. • A Denominação de Origem é o nome geográfico de um país, cidade, região ou uma localidade que designe produto ou serviço cujas qualidades ou características se devam exclusivamente ao meio geográfico, incluídos fatores naturais e humanos. O objetivo deste Projeto é agregar valor aos cafés especiais produzidos na microrregião, que já possuem tradição, notoriedade e historicamente destacam-se pela alta qualidade comprovada pelos melhores concursos de qualidade de café do Brasil. Apresentação em Portland, Estados Unidos, com a organização da Specialty Coffee Association of America (SCAA). O cafeicultor Jesimar de Oliveira Sandi, proprietário do Sítio São Joaquim, no município de Conceição das Pedras, região Sul de Minas Gerais, produziu o melhor café natural do Brasil na safra 2012, sagrando-se campeão do 2º Concurso de Qualidade Cafés do Brasil 'Cup of Excellence Natural Late Harvest' com a nota 92,13 pontos (escala de 0 a 100). O anúncio foi feito na noite da última sexta-feira, 25 de janeiro, na cerimônia de premiação do certame organizado pela Associação Brasileira de Cafés Especiais (BSCA, sigla em inglês), em parceria com a Agência Brasileira de Promoção de Exportações e Investimentos (Apex-Brasil) e Alliance for Coffee Excellence (ACE). A segunda e a terceira posições ficaram, respectivamente, com os cafés de Amauri Dias de Castro, da Fazenda São José, localizada na cidade de Jesuânia (MG), com a nota 90,30, e José Flávio Ferraz Reis, proprietário da Fazenda JR (Junqueira Reis), em Carmo de Minas (MG), com 90,20 pontos, segundo a avaliação do júri internacional do concurso. Os três primeiros colocados, por terem recebido notas superiores a 90 pontos, foram considerados cafés presidenciais. De acordo com Silvio Leite, juiz principal do certame, a qualidade apresentada pelos cafés naturais - colhidos e secos com casca - do Brasil na safra 2012 foi surpreendente e conquistou os membros do júri. "Os jurados internacionais demonstraram muito interesse e entusiasmo com a diversidade de sabores dos cafés naturais do Brasil. Sem exagero, em algumas provas do produto eles ficaram boquiabertos", destaca. Leite completa elogiando a estrutura disponibilizada pela organização do Cup of Excellence no país. "O espaço disponibilizado na (Cooperativa dos Cafeicultores da Zona de Varginha) Minasul é excelente e favoreceu muito o andamento dos trabalhos". 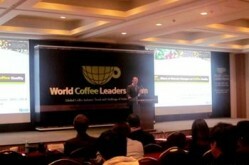 No total, 22 lotes de café tiveram notas superiores a 85 pontos e se sagraram vencedores do 2º Concurso de Qualidade Cafés do Brasil 'Cup of Excellence Natural Late Harvest' - Edição 2012 (veja a lista no site da BSCA: http://bsca.com.br/cup-of-excellence-late-harvest.php?id=12). Além da premiação, essas amostras ganharam o direito de serem ofertadas no disputado leilão internacional, via internet, no dia 14 de março, quando os principais compradores de café do mundo voltarão sua atenção ao cafés brasileiros. O principal concurso de qualidade para cafés produzidos por via seca do Brasil conta com o apoio institucional de Associação Brasileira de Indústria de Café (Abic), Conselho dos Exportadores de Café do Brasil (CeCafé), Conselho Nacional do Café (CNC) e Cooperativa dos Cafeicultores da Zona de Varginha (Minasul) e com o patrocínio do Serviço Brasileiro de Apoio às Micro e Pequenas Empresas (Sebrae). A auditoria está a cargo do Centro do Comércio de Café do Estado de Minas Gerais (CCCMG). O leilão dos 24 lotes vencedores do 13º Concurso de Qualidade Cafés do Brasil "Cup of Excellence Early Harvest" - Edição 2012, realizado pela Associação Brasileira de Cafés Especiais (BSCA, sigla em inglês), em parceria com a Agência Brasileira de Promoção de Exportações e Investimentos (Apex-Brasil) e com a Alliance for Coffee Excellence (ACE), ocorreu nesta última quinta-feira, dia 10 de janeiro, por intermédio da internet. Todos os cafés foram negociados, com a movimentação gerando uma receita total na ordem de US$ 395.096,52 (* R$ 802.045,94), a uma média de US$ 5,54 por libra peso, o que equivale a US$ 732,83 (* R$ 1.487,64) por saca de 60 kg e representa alta de 270,20% sobre o fechamento do dia na Bolsa de Nova York (US$ 1,4965 por libra peso no contrato março, o mais negociado). Ao término dos negócios, o maior lance registrado foi de US$ 12,10 por libra peso (alta de 708,55% ante NY), pago pelo consórcio formado pelas empresas japonesas Maruyama Coffee, Saza Coffee, Uchida Coffee e Coffee-a-gogo, além da empresa Orsir Coffee, de Taiwan. Esse valor equivale a US$ 1.600,59 (* R$ 3.249,20) pagos por cada uma das 17 sacas da Fazenda do Moinho, situada em Olímpio Noronha (MG). O lote rendeu um total de US$ 27.209,45 (* R$ 55.235,18) ao produtor Vinícius José Carneiro Pereira, vencedor do concurso destinado exclusivamente aos cafés brasileiros produzidos por via úmida (cerejas descascados ou despolpados) na safra 2012. O segundo melhor lance do pregão foi dado para os grãos produzidos pelo vice-campeão do concurso, Dimas Mendes Bastos, proprietário da Fazenda Serra do São Bento, em Araponga (MG). Seu lote, de 19 sacas, foi arrematado pelas empresas Campos Coffee, que pagou US$ 1.322,80 (* R$ 2.685,28) por saca, gerando um total de US$ 25.132,69 (* R$ 51.019,36). O resultado completo do leilão pode ser acessado no site da BSCA. Ampliando Horizontes — O trabalho de promoção dos cafés especiais brasileiros realizado pela BSCA conjuntamente com seus parceiros — Ministério da Agricultura, Pecuária e Abastecimento (Mapa), Apex-Brasil, Sebrae e Embratur — deu mais uma demonstração de sua força, haja vista que, pela primeira vez na história do concurso, uma empresa da França adquiriu lotes vencedores. A importadora francesa Belco, em representação a outras empresas, comprou dois lotes campeões do concurso, pagando US$ 1.005,33 por saca de um deles e US$ 548,96 por saca do outro. Segundo Vanusia Nogueira, diretora-executiva da Associação, esse fato revela que o café especial brasileiro, além de ampliar seus horizontes em mercados emergentes, como China (compradora do lote campeão do Cup of Excellence Natural Late Harvest 2011), e Taiwan (integra o consórcio que comprou o lote campeão deste torneio), consolida-se cada vez mais em mercados tradicionais como o francês. “Isso é fruto do excelente trabalho de promoção e divulgação da qualidade excepcional dos Cafés do Brasil mundo afora”, comenta. Apoio — O 13º Concurso de Qualidade Cafés do Brasil "Cup of Excellence Early Harvest" foi patrocinado pelo Serviço Brasileiro de Apoio às Micro e Pequenas Empresas (Sebrae) e contou com o apoio institucional da Associação Brasileira da Indústria de Café (Abic), do Conselho dos Exportadores de Café do Brasil (CeCafé), do Conselho Nacional do Café (CNC) e da Cooperativa de Cafeicultores da Zona de Varginha (Minasul). A auditoria de todas as etapas ficou a cargo do Centro de Comércio do Café do Estado de Minas Gerais. * Dólar cotado a R$ 2,030, conforme fechamento de 10/01/2013. As informações são da BSCA, adaptadas pelo CaféPoint. Produtores de Minas Gerais se destacaram no 9º Concurso Nacional ABIC de Qualidade do Café. O cafeicultor José Alexandre de Lacerda na Fazenda Forquilha do Rio, situada na cidade Espera Feliz, foi o vencedor do concurso, com seu café recebendo a nota de 84,63 pontos de qualidade global na xícara. Alem de campeão, esse café também conquistou o 1º lugar na categoria Microlote. Na categoria Cereja Descascado, o café vencedor foi o do produtor José Roberto Canato, da Fazenda Monte Verde, de Carmo de Minas, que recebeu a nota 82,15. E na categoria Natural, a maior nota foi dada ao café produzido por Amélia F. Delarisse, da Fazenda Apucarana, situada em Patrocínio: 81,75 pontos. A avaliação sensorial foi feita na terça-feira (8), no laboratório do Sindicafé - São Paulo, por um júri integrado por provadores e árbitros da mais alta qualificação, coordenado por Ensei Neto, da Specialty Coffee Bureau. Todos os procedimentos seguiram a metodologia do PQC – Programa de Qualidade do Café, da ABIC, para grãos torrados, combinada com a metodologia da SCAA – Specialty Coffee Association of America, para grão verde. A avaliação das amostras foi feita às cegas, sem identificação da origem. Os juízes avaliaram a qualidade global do café na xícara, pontuando notas de 0 a 100 para propriedades como: aroma, sabor, corpo e retrogosto. Promovido pela ABIC – Associação Brasileira da Indústria de Café, o evento entra agora na etapa do leilão dos oito lotes finalistas do concurso, que será realizado até 17 de janeiro. Só poderão participar empresas compradoras – indústrias, cafeterias restaurantes, etc. – que se inscreverem e declararem compromisso, por escrito na ficha de lance, de comprar os lotes pelos quais farão ofertas. Este compromisso pode ser enviado por meio eletrônico, com assinatura ‘escaneada’ ou por correio, com assinatura original. Nesta edição, não será aceita a participação de pessoas físicas. A ficha de inscrição com declaração de compromisso de compra está no site da Abic e pode ser solicitada no e-mail daysi@abic.com.br. Os lances poderão ser dados presencialmente ou via internet, para o mesmo email, durante os dias do leilão, das 9h às 17h. É permitida a formação de consórcios de empresas para aquisição dos lotes. As informações são da Abic, adaptadas pelo CaféPoint. O reajuste de 9% no salário mínimo, que desde 1º de janeiro de 2013 passou de R$ 622 para R$ 678, irá onerar ainda mais a cafeicultura brasileira, que tem na cultura de montanha (próximo a 70% da produção nacional) sua maior atividade, onde a mecanização é inviabilizada pelo tipo de relevo. De acordo com o presidente da Associação dos Produtores de Café da Mantiqueira (Aprocam), Antônio José Junqueira Villela, a cafeicultura da região irá sofrer forte impacto com o aumento do salário mínimo: "Em nossa região, a mão de obra é muito utilizada ao longo de todo o ano, sendo necessária desde o início, na aplicação dos tratos culturais, até no período de colheita. Como trabalhamos em áreas montanhosas, a mecanização é muito pequena e, quando ocorre, geralmente não dispensa o serviço humano, só proporciona maior agilidade aos trabalhos", disse Villela. Ainda de acordo com o presidente da Aprocam, os custos com a mão de obra respondem por 60% a 70% do valor de uma saca de 60 quilos de café. Atualmente, com o volume sendo negociado entre R$ 340 e R$ 350, os cafeicultores estão acumulando prejuízos, uma vez que o custo gira em torno de R$ 370. "Com o aumento dos custos, desenvolver a cafeicultura nas montanhas está cada vez mais difícil. Na região da Aprocam produzimos grande volume de café especial, e este precisa se diferenciar no mercado. Precisamos de condições para manter a qualidade, as exportações e para que continuemos a gerar empregos e renda no campo", disse Villela. Qualidade - Devido ao aumento dos custos, muitos cafeicultores estão optando pela redução dos investimentos na cultura, o que pode acarretar em redução da qualidade e da produção. Além disso, em casos mais extremos, os produtores estão migrando para culturas mais lucrativas. Na região de atuação da Cooperativa dos Cafeicultores da Zona de Três Pontas (Cocatrel), no Sul do Estado, os produtores estão cautelosos e planejando os investimentos nos cafezais para tentar reduzir o impacto provocado pelo encarecimento da mão de obra. Na região, cerca de 40% dos cafezais possui algum tipo de mecanização. "Para o café a mão de obra é extremamente importante, principalmente pela maior parte da região de atuação da Cocatrel ser montanhosa e não ter condições de mecanizar. O momento atual deve ser utilizado pelo cafeicultor para planejar os investimentos e priorizar o aumento da produtividade, reduzindo, em partes, o impacto do encarecimento do salário mínimo", disse o presidente da Cocatrel, Francisco Miranda de Figueiredo Filho. Segundo Figueiredo, o custo com a mão de obra responde por 50% da composição dos preços da saca de café, que na região é negociada em torno de R$ 340. O preço ideal, para cobrir os custos e gerar lucro, segundo os produtores, deveria ser de pelo menos R$ 400. Zona da Mata - De acordo com o diretor-presidente da Cooperativa dos Cafeicultores da Região de Lajinha Ltda (Coocafé), na Zona da Mata, Fernando Romeiro de Cerqueira, o aumento do salário mínimo tem efeito cascata na cafeicultura, já que o reajuste também impacta na indústria de insumos, como a de fertilizantes, por exemplo. "A situação atual é complicada, já que os custos estão em alta e não temos como repassar o encarecimento para o preço final, que está com a cotação inferior à necessária para gerar lucro. Nas regiões montanhosas a situação é ainda mais grave, uma vez que o uso de mão de obra é obrigatório", disse Cerqueira. Na região de Lajinha a saca de 60 quilos do café bebida é negociada a R$ 320 e do café rio a R$ 270, enquanto os custos variam entre R$ 300 e R$ 330. As informaçõe são do Diário do Comércio, adaptadas pelo CaféPoint. Foram revelados na última quinta-feira, em Carmo de Minas (MG), os lotes vencedores do 1º Concurso de Qualidade de Café - Cocarive. Avaliados por seis Q Graders - habilitação profissional que pode ser traduzida como analista de qualidade - os 74 lotes de cafés natural e cereja descascado foram inscritos por aproximadamente 40 produtores cooperados da Cocarive - Cooperativa Regional dos Cafeicultores do Vale do Rio Verde. As premiações foram definidas a partir da análise individualizada dos atributos Fragrância/Aroma, Sabor, Acidez, Corpo e Aftertaste. “Esse critério vai ao encontro de uma tendência mundial crescente entre os consumidores de cafés de alta qualidade, que têm buscado bebidas segundo características sensoriais muito particulares. O concurso da Cocarive fortalece ainda mais esse grau de refinamento”, afirma Jack Robson Silva, coordenador de Qualidade Nucoffee e um dos Q Graders responsáveis pela avaliação dos lotes. O julgamento do 1º Concurso de Qualidade de Café - Cocarive obedeceu ao protocolo definido pelo CQI - Coffee Quality Institute, entidade americana que é referência mundial em cafés de alta qualidade e que também é responsável pela formação dos analistas. O evento é apoiado por Nucoffee, iniciativa da Syngenta que pretende valorizar o café especial brasileiro e abrir portas para o cafeicultor nacional em outros países. Origem de muitos dos principais cafés especiais produzidos no Brasil, a Região da Serra da Mantiqueira, que compreende o Vale do Rio Verde, é reconhecida desde junho de 2010 com o selo Indicação de Procedência, distinção conferida pelo INPI – Instituto Nacional da Propriedade Industrial. — Cultivado por Vinícius José Carneiro Pereira na Fazenda do Moinho, o produto recebeu a maior nota do júri internacional no principal concurso de qualidade destinado a cafés produzidos por via úmida (cereja descascado ou despolpado) no Brasil. 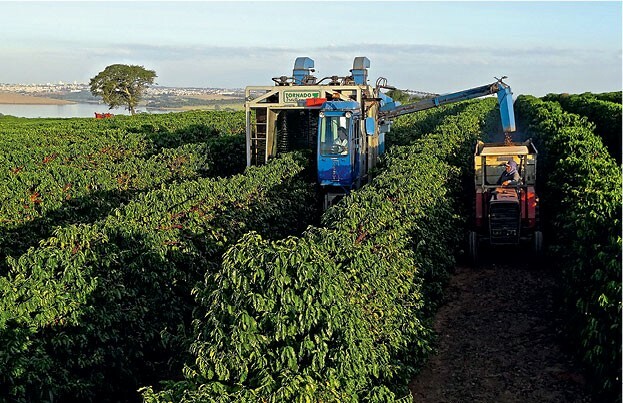 O café cultivado, por via úmida, pelo produtor Vinícius José Carneiro Pereira, na Fazenda do Moinho, em Olímpio Noronha, Estado de Minas Gerais, foi eleito o melhor cereja descascado/despolpado do Brasil na safra 2012. A avaliação é do júri internacional do 13º Concurso de Qualidade Cafés do Brasil ‘Cup of Excellence Early Havest’ – Edição 2012. Com a nota 91,79, esse lote também foi considerado café presidencial pelos juízes. A cerimônia de premiação foi realizada na noite desta sexta-feira (09/11), em Jacarezinho (PR), ao longo da Feira Internacional de Cafés Especiais do Norte Pioneiro do Paraná – Ficafé 2012. No total, foram 24 os vencedores do principal concurso de qualidade para cafés produzidos por via úmida no Brasil, que representam três dos principais estados produtores: Minas Gerais, São Paulo e Bahia. Além do campeão, o segundo e o terceiro colocados também alcançaram notas superiores a 90 pontos, sendo considerados presidenciais. Esses cafés foram produzidos por Dimas Mendes Bastos, na Fazenda Serra do São Bento, em Araponga (MG), e pelo grupo Café Orfeu, na Fazenda Sertãozinho, em Botelhos (MG), respectivamente. 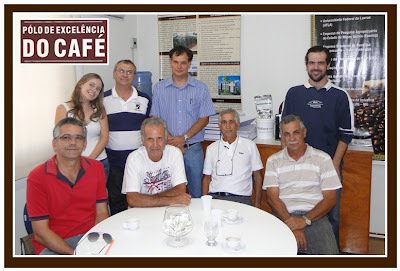 Veja todos os ganhadores no site da BSCA (http://bsca.com.br/cup-of-excellence.php?id=11). LEILÃO INTERNACIONAL — No dia 10 de janeiro de 2013, o Brasil será o centro das atenções dos principais compradores de cafés especiais de todo o mundo. Na data, os 24 lotes vencedores do 13º Concurso de Qualidade Cafés do Brasil serão negociados, através da internet, no disputado leilão do Cup of Excellence. O lote campeão do certame anterior, por exemplo, teve cada uma de suas 22 sacas negociada a US$ 3.055.58, o que resultou em um total de US$ 67.222,66 (R$ 118.782,44 - conforme cotação do dólar à época). REALIZAÇÃO E APOIO — Promovido pela Associação Brasileira de Cafés Especiais (BSCA, sigla em inglês) em parceria com Alliance for Coffee Excelence (ACE) e Agência Brasileira de Promoção de Exportações e Investimentos (Apex-Brasil), o concurso é patrocinado pelo Serviço Brasileiro de Apoio às Micro e Pequenas Empresas (Sebrae) e conta com o apoio institucional da Associação Brasileira da Indústria de Café (Abic), do Conselho dos Exportadores de Café do Brasil (CeCafé), do Conselho Nacional do Café (CNC), da Cooperativa de Cafeicultores da Zona de Varginha (Minasul) e da Secretaria de Agricultura do Paraná, por intermédio de suas vinculadas EMATER-PR e Instituto Agronômico do Paraná (IAPAR). 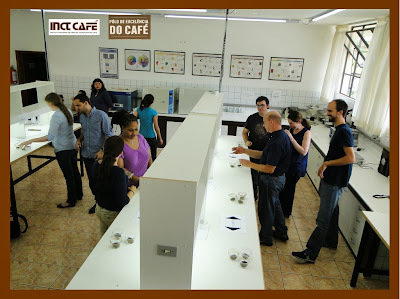 Foram 42 amostras recebidas e 30 cafés selecionados às cegas para participar da Rodada de Negócio na Sala de Cupping do Espaço Café Brasil, realizado de 4 a 6 de outubro de 2012. Lá eles foram colocados à prova e as sacas vendidas durante o evento. Destes 30 cafés, apenas 10 foram escolhidos de acordo com uma pré-seleção, codificados e colocados para votação do público em método filtrado e sem divulgação de nome ou região. Foram mais de 500 votos durantes os três dias de feira. O público presente se dedicou a provar, analisar e debater qual era o melhor café para o seu paladar. O resultado traz cafés de produtores familiares, marcas já conhecidas do público e a região de Minas Gerais em destaque, com presença de nove entre 10 amostras. O grande vencedor foi o Café Orfeu, da Fazenda Sertãozinho, da cidade de Botelhos, em Minas Gerais. O primeiro lugar receberá o prêmio de R$ 2.000,00 e ainda o selo Coffee of The Year Brasil, o café do ano. O Espaço Café Brasil está na 7ª edição e é considerada a maior feira de café da América Latina. Com a co-realização da Associação Brasileira de Cafés Especiais (BSCA), funciona como uma plataforma de negócios e desenvolvimento do setor. O evento reuniu toda a cadeia cafeeira, desde o produtor até o consumidor final. Este ano é realizado no período pós-colheita, por isso compradores nacionais e internacionais, especialistas e consumidor degustaram as safras atuais de lotes e microlotes de cafés frescos. Foram mais de 80 marcas expondo novos produtos, tecnologias e inovações. Também participaram cooperativas, torrefadoras, exportadoras e cafeterias. A Região da Serra da Mantiqueira de Minas Gerais, detentora do Registro de “Indicação de Procedência”, vem convidá-lo a participar da Sala de Cupping, onde serão apresentados cafés de altíssima qualidade. Essa região destaca-se pela elevada qualidade sensorial dos cafés produzidos, sendo considerada uma das mais importantes regiões produtoras de café especiais do Brasil. As características singulares dos cafés da “ Região da Serra da Mantiqueira de Minas Gerais ” e a consistência apresentada nos resultados dos principais concursos de qualidade realizados no Brasil comprovam a vocação dessa região para a produção de cafés especiais, devido a isso região vem obtendo reconhecimento tanto pelo mercado nacional como internacional. A cafeicultura mundial vem ganhando formas de avaliação sensorial mais avançada, procurando identificar os aromas e sabores particularidades de cada origem. Devido a essa busca por origem, as entidades da região trabalham unidas num esforço único de preservação da tradição da cafeicultura e criação de uma marca que expresse a região e o café produzido. Você é nosso convidado especial para degustar este café! Café produzido por Tulio Junqueira na fazenda Carmo Estate Coffees, em Minas Gerais, foi escolhido pela torrefação austríaca Julius Meinl, que venderá a bebida no World of Coffee - Vienna 2012. Entre os dias 12 e 15 de junho, a Specialty Coffee Association of Europe (SCAE) realizará, em Viena, Áustria, mais uma edição do World of Coffee, maior evento do setor no Velho Continente. E o Brasil, destacando-se cada vez mais no segmento de produtos especiais, dará o sabor à feira. O café produzido por Tulio Junqueira, na fazenda Carmo Estate Coffees, em Heliodora, Minas Gerais, foi o selecionado pela tradicionaltorrefação austríaca Julius Meinl, que celebrará seus 150 anos na feira oferecendo o sabor brasileiro aos mais de 10 mil participantes esperados pela organização. Em sua programação principal, a feira em Viena também agregará o World Barista Championship, o World Cup Tasters Championship, o World Brewers Cup, o Cezve-Ibrik Championship e o Coffee Roasting Challenge, certames criados pela World Coffee Events (WCE), instituição fundada pela SCAE em parceria com a Specialty Coffee Association of America (SCAA) com a missão de desenvolver eventos que envolvam a comunidade de cafés especiais e promovam a excelência do produto. 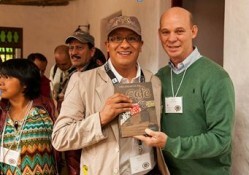 Para o World of Coffee - Vienna 2012, a SCAE e a torrefação Julius Meinl apresentarão um lote especial doscafés brasileiros da Carmo Estate Coffees, que terá a assinatura “Pasión de Brasil”. Esse produto é oriundo das montanhas férteis do Sul de Minas Gerais, sendo amadurecido sobre o brilho do sol sul-americano, o que lhe proporciona um aroma cativante completo e um delicado sabor de chocolate com notas frutadas. Tulio, associado e ex-presidente da Associação Brasileira de Cafés Especiais (BSCA, sigla em inglês), faz parte da quinta geração da família Junqueira no café. A Carmo Estate Coffees possui 220 hectares dedicados à atividade nessa microrregião privilegiada, com esplêndido relevo montanhoso, fontes de água mineral e condições ideais para o cultivo de cafés especiais. As variedades Mundo Novo, Catuaí, Bourbon, Acaiá e Icatu cultivadas nessa favorável geografia conquistaram a Julius Meinl e, com certeza, irão cativar o público presente na maior feira de cafés especiais da Europa. Nessa segunda-feira (26), representantes da Cooperativa Regional dos Cafeicultores do Vale do Rio Verde (Cocarive), sediada em Carmo de Minas, sul do Estado, fizeram uma visita técnica à Universidade Federal de Lavras (UFLA) e ao Polo de Excelência do Café com um desafio: encontrar soluções para a mecanização das lavouras de café em áreas de montanha, em especial, para a colheita. O problema com mão de obra para as lavouras de café é antigo e tem se acentuado nos últimos anos, com custo elevado e escassez de trabalho qualificado. De acordo com o extensionistas da Emater de Carmo de Minas, Luciano Neves, o custo com a mão de obra na colheita chega a representar 60% dos custos totais de produção, reduzindo consideravelmente a competitividade do cafeicultor em áreas não mecanizáveis. Para o presidente da Cocarive, Ralph de Castro Junqueira, vencedor de concursos estaduais de qualidade, mesmo com um produto diferenciado, os custos com a colheita fazem com que o café da montanha seja menos competitivo quando comparado ao sistema mecanizado. Segundo ele, o custo do café colhido manualmente chega a ser 120 reais a mais por saca que o café colhido por máquinas. O diretor da Cocarive, Gláucio Carneiro Pinto reforça a necessidade de haver uma articulação para um projeto colaborativo para o desenvolvimento de uma máquina adaptada à cafeicultura de montanha e que seja mais eficiente que as costais que ficaram conhecidas como “mãozinhas”. A reunião contou com a presença do gerente executivo do Polo de Café, Edinaldo José Abrahão, dos professores da UFLA: prof. Rubens José Guimarães (cafeicultura), prof. Mário Lúcio Vilela de Resende (fitopatologia), prof. Fábio Moreira da Silva (máquinas e mecanização agrícola) e do consultor Marcio Daúd. Aproveitando a visita, os representantes da Cocarive também visitaram a Incubadora de Empresas de Base Tecnológica da UFLA (Inbatec), onde conheceram as tecnologias desenvolvidas pelas empresas T-Bit (olho digital do café), Mitah Technologies (sistema de rastreamento) e Agrofitness Tecnologia Agrícola (composto indutor de resistência). O grande vencedor do 21º Prêmio Ernesto Illy de Qualidade do Café para Espresso foi José Lourenço Filho. O cafeicultor da região das Matas de Minas (MG) foi premiado com R$ 50 mil durante a entrega do tradicional concurso, em cerimônia realizada pela illycaffè no dia 16 de março, em São Paulo (SP). No total, a empresa distribuiu mais de R$ 180 mil em prêmios aos 50 finalistas e a cinco classificadores eleitos. O prêmio, realizado há 21 anos no país, já soma mais de US$ 4 milhões oferecidos aos produtores de café. Entre os primeiros colocados na lista dos melhores cafés brasileiros da safra 2011/2012, a segunda posição ficou para Marisa Coli Noronha, que ganhou R$ 35 mil; o terceiro lugar ficou para José Flávio Ferraz Reis, que levou o prêmio de R$ 18 mil; o quarto colocado, Dimas Mendes Bastos, recebeu R$ 9 mil; o quinto lugar foi de Édio Anacleto Miranda, que ganhou R$ 5 mil. Os produtores classificados do sexto ao décimo lugar foram reconhecidos com R$ 2 mil cada um. O sexto premiado foi Antônio de Azevedo e Silva Júnior; no sétimo lugar, ficou Pedro Aescio de Souza; no oitavo lugar, Marina Scognamiglio Ribeiro do Valle; em nono lugar, Carlos Roberto de Miranda; e o décimo colocado foi Edivandro Martins Amâncio. Os demais 40 finalistas receberam R$ 1,2 mil cada um. Nesta edição do Prêmio Ernesto Illy de Qualidade do Café para Espresso, somente o Estado de Minas Gerais disputou as primeiras colocações, com 10 produtores entre os 10 vencedores. Entre as regiões, o destaque ficou para as Matas de Minas, com seis finalistas, incluindo o campeão. 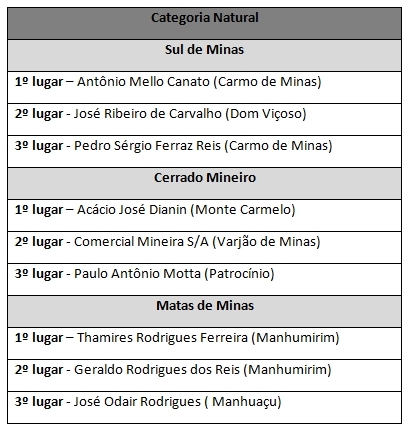 Três vencedores são da região do Sul de Minas e um do Cerrado Mineiro. De julho a setembro de 2011, a illycaffè recebeu quase 500 amostras vindas de diferentes Estados do Brasil, tais como: Minas Gerais, São Paulo, Paraná, Bahia, Goiás e Espírito Santo. No total, entre os 50 finalistas divulgados em novembro, Minas Gerais conquistou 48 posições e São Paulo as outras duas colocações. A análise e classificação dos cafés foram realizadas pela Assicafé, laboratório científico que presta serviço exclusivo à marca no Brasil. As 50 amostras finalistas foram avaliadas por especialistas brasileiros e estrangeiros, utilizando as mais avançadas técnicas de seleção, sob a coordenação do Dr. Aldir Alves Teixeira, consultor técnico da illycaffè. Entre os classificadores, selecionados a partir do número de amostras inscritas, em primeiro lugar ficou Edivaldo Batista Generoso (3 Irmãos Corretora de Café), com um prêmio de R$ 3,5 mil. O segundo melhor colocado foi Wellington Carlos Pereira (Cocarive), com reconhecimento de R$ 2,5 mil; o terceiro colocado foi Luiz Evandro Ribeiro (Cooxupé), que levou o prêmio de R$ 1,5 mil; o quarto lugar foi de João Bernardo de Medeiros Neto (Peneira Alta Armazéns Gerais), com reconhecimento de R$ 1 mil; e o quinto colocado entre os classificadores foi Márcio Prado (Exportadora Guaxupé), com prêmio de R$ 1 mil. Escolhido pelo júri do Clube illy do Café, o “Fornecedor do Ano” safra 2011/2012 foi Virgolino Adriano Muniz, de Minas Gerais. O produtor e um acompanhante farão uma viagem cultural à Itália, onde conhecerão a sede da illycaffè, em Trieste, além da famosa cidade de Veneza. O júri, que elegeu o produtor da região do Sul de Minas, considerou critérios como: fidelidade no fornecimento; eficiência; pontualidade na entrega; condições do produto; correspondência do lote com a amostra original; ordem da documentação; cumprimento da qualidade e quantidades vendidas; participação no Programa de Reconhecimento às Melhores Práticas & Sustentabilidade; e participação no 21º Prêmio Ernesto Illy de Qualidade do Café para Espresso. O “Diploma de Reconhecimento às Melhores Práticas e Sustentabilidade”, instituído desde 2008, foi concedido à Cambuhy Agrícola, de Matão (SP). Parte do Programa de Reconhecimento às Melhores Práticas & Sustentabilidade, os Questionários de Sustentabilidade foram respondidos por 270 produtores inscritos no Clube illy do Café. E, após visitas técnicas a 249 fazendas participantes, a comissão de avaliação considerou que as propriedades estão empregando melhores práticas agrícolas e buscando soluções para se tornarem sustentáveis sob o ponto de vista social, ambiental e econômico. Sinal de que o engajamento dos cafeicultores é a cada ano maior. O leilão dos 19 lotes vencedores do 1º Cup of Excellence - Natural Late Harvest, realizado pela Associação Brasileira de Cafés Especiais (BSCA, sigla em inglês), em parceria com a Agência Brasileira de Promoção de Exportações e Investimentos (Apex-Brasil) e com a Alliance for Coffee Excellence (ACE), ocorreu nesta quarta-feira, dia 14 de março, através da internet. Todos os cafés foram negociados, com a movimentação gerando uma receita total na ordem de US$ 368.794,25 (* R$ 666.411,21), a uma média de US$ 8,36 por libra peso, o que equivale a US$ 1.105,82 (* R$ 1.998,22) por saca de 60 kg e representa alta de 355% sobre o fechamento do dia na Bolsa de Nova Iorque (US$ 1,8360 por libra peso no contrato maio, o mais negociado). De acordo com o presidente da BSCA, Luiz Paulo Dias Pereira Filho, essa é a maior média registrada na história do Cup of Excellence no Brasil. "Iniciamos os leilões em 1999, tendo como foco todos os cafés arábicas produzidos no País. Este ano, criamos o concurso destinado exclusivamente aos cafés naturais e temos muito a comemorar, pois o lance médio do leilão é recorde nacional, evidenciando a qualidade do café colhido e seco com casca, que responde por cerca de 85% da produção no Brasil", celebra. A melhor média registrada anteriormente era de US$ 8,32 por libra peso, apurada no leilão de 2010. Ao término dos negócios, o maior lance registrado foi de US$ 19,10 por libra peso (alta de 940,31% ante Nova Iorque), pago pela empresa Mocoway Enterprise Management International Co.,Ltd, da China. Esse valor equivale a US$ 2.526,55 (* R$ 4.565,48) pagos por cada uma das 18 sacas do Sítio Colinas, situado em Carmo de Minas (MG), Região da Serra da Mantiqueira. O lote rendeu um total de US$ 45.476,91 (* R$ 82.176,78) ao produtor Luiz Flávio Pereira de Castro, vencedor do concurso destinado exclusivamente aos cafés naturais do Brasil. A diretora-executiva da BSCA, Vanusia Nogueira, explica que, pela primeira vez na história dos leilões do Cup of Excellence no mundo, a China foi compradora de um lote dos produtos vencedores. "O aval para a compra foi dado por um barista campeão naquele país, o qual vem 'garimpando' cafés de boa qualidade em todo o planeta", relata. Vanusia expõe, ainda, que este pode ser um sinal da abertura do mercado chinês para os cafés brasileiros. "Estudaremos este nicho e, sendo esta uma tendência, a intenção é penetrarmos cada vez mais no promissor mercado chinês", indica. O segundo melhor lance do pregão foi dado para os grãos produzidos pela vice-campeã do concurso, Ana Cristina Junqueira Vilela, proprietária do Sítio Vista Alegre, em Dom Viçoso, Sul de Minas Gerais. Seu lote, de 17 sacas, foi arrematado pelas empresas Maruyama Coffee e Mikatajuku Group, do Japão, em conjunto com a Orsir Coffee, de Taiwan, que pagaram US$ 2.222,25 (* R$ 4.015,61) por saca, gerando um total de US$ 37.778,33 (* R$ 68.265,44). O resultado completo do leilão pode ser acessado no site da BSCA (http://bsca.com.br/concurso.php?id=8). O 1º Cup of Excellence - Natural Late Harvest teve todas as etapas auditadas pela IMO Control do Brasil e contou com o apoio institucional da Associação Brasileira da Indústria de Café (Abic), do Centro de Excelência do Café do Sul de Minas (CEC - Sul de Minas), do Conselho dos Exportadores de Café do Brasil (CeCafé), do Conselho Nacional do Café (CNC) e da Cooperativa dos Cafeicultores da Zona de Varginha (Minasul). Além disso, a BSCA firmou uma parceria com o Sebrae, que foi patrocinador deste leilão e também será dos certames do Cup of Excellence no Brasil na safra 2012. Que o Brasil é o país líder em produção de café, todos já sabem. Que o Brasil tem investido não apenas em quantidade, mas também na qualidade da bebida, é a mensagem que o país vem passado ao mercado. Na última sexta-feira (27), Varginha sediou a final do primeiro concurso de cafés naturais Cup of excellence, onde um grupo de 20 juízes internacionais teve uma grata confirmação: sim, o Brasil tem cafés naturais de excelência, com notas que superaram as expectativas. O concurso foi organizado pela Associação Brasileira de Cafés Especiais (BSCA – sigla em Inglês) em parceria com a Agência Brasileira de Promoção de Exportações e Investimentos (Apex-Brasil) e a Alliance for Coffee Excellence (ACE). A cerimônia de divulgação e premiação dos finalistas foi realizada no Lagamar Resort Hotel (Varginha), com a presença de produtores, lideranças, profissionais do setor e compradores das principais importadoras de cafés especiais brasileiros. Quatro das amostras finalistas receberam notas acima de 90 pontos na escala da Associação Americana de Cafés Especiais (SCAA), nas provas realizadas na sede da Cooperativa dos Cafeicultores da Zona de Varginha (Minasul). Esses cafés são chamados entre os juízes e baristas como “cafés presidenciáveis”. Dos 19 cafés finalistas, apenas três amostras não são do Sul de Minas. Dez delas são de propriedades de Carmo de Minas, município que pertencente a Região da Serra da Mantiqueira e que conquistou recentemente o registro de Indicação Geográfica (IG), modalidade Indicação de Procedência (IP) para o café produzido na região demarcada. O campeão do concurso foi o cafeicultor Luiz Flávio Pereira de Castro, do Sitio Colinas, Município de Carmo de Minas com a pontuação 92,656 (SCAA). 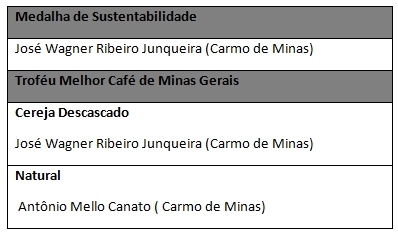 Os cafés que receberam a melhor pontuação em todo o concurso, na categoria Natural e Cereja Descascado (CD), são de Carmo de Minas, no Sul de Minas. O cafeicultor José Wagner Ribeiro Junqueira recebeu a premiação pelo melhor café CD e também foi homenageado com a Medalha de Sustentabilidade. O melhor café da categoria Natural foi do produtor Antônio Mello Canato. Um microlote de uma saca de cada uma dessas amostras foi leiloado por 5 mil reais cada. Todos os lotes tiveram valor de venda mínimo de R$610,00. Em sua 8ª edição, o Concurso Estadual de Qualidade dos Cafés de Minas Gerais teve a inscrição recorde de 1.637 amostras das quatro regiões cafeeiras do Estado: Cerrado, Chapadas de Minas, Matas de Minas e Sul de Minas. Participaram da cerimônia de premiação os 106 finalistas do concurso – 48 na categoria “natural” e 58 na categoria “cereja descascado”. Desse total, foram selecionados os três melhores cafés de cada categoria e em cada região. Durante a solenidade foram entregues certificados, troféus e prêmios (moto, TV e equipamentos para colheita do café) aos participantes. O reitor da Universidade Federal de Lavras, professor Antônio Nazareno Guimarães, o reitor do Instituto Federal de Educação Ciência e Tecnologia do Sul de Minas, professor Sérgio Pedini e o presidente da Emater, Maurílio Soares Guimarães, entregaram placas de homenagens a oito parceiros do concurso estadual: Organização das Cooperativas de Minas Gerais (Ocemg), Federação da Agricultura do Estado de Minas Gerais (Faemg), Federação dos Trabalhadores na Agricultura do Estado de Minas Gerais (Fetaemg), Basf, Café Brasil, Carmo Coffees, Fertilizantes Heringer e Syngenta. A solenidade no Palácio Tiradentes foi prestigiada por lideranças nacionais, estaduais e cafeicultores das principais regiões produtoras. Também participaram o vice-governador, Alberto Pinto Coelho, o secretário da Agricultura, Pecuária e Abastecimento, Elmiro Nascimento, e secretários de Estado, em especial, Carlos Melles - atual secretário de Transporte e Obras Públicas, e o deputado estadual Antônio Carlos Arantes, defensores da atividade cafeeira durante toda a trajetória política. O 8º Concurso Estadual dos Cafés de Minas foi promovido pela Secretaria de Estado de Agricultura, Pecuária e Abastecimento (Seapa), por meio da EMATER-MG e apoio da UFLA. A iniciativa tem como parceiros o Instituto Mineiro de Agropecuária (IMA), o Instituto Federal de Educação, Ciência e Tecnologia de Sul de Minas - Campus Machado, a Empresa de Pesquisa Agropecuária de Minas Gerais (Epamig); o Centro de Excelência de Café de Machado; o Polo de Excelência de Café, o Sindicafé-MG, além de cooperativas e demais instituições do setor. A Serra Mantiqueira, no sul de Minas Gerais, é a primeira microrregião produtora de café do Brasil a receber o selo de Indicação de Procedência do Instituto Nacional de Propriedade Industrial (INPI). Apenas quatorze regiões no país possuem a certificação, entre elas, o Cerrado Mineiro, que produz cerca de 4 milhões de sacas por ano. A região da Serra da Mantiqueira produz 1 milhão de sacas e é conhecida pela alta qualidade dos grãos. A microrregião da Serra da Mantiqueira é formada por 22 municípios (veja arte). As lavouras estão localizadas nas montanhas, entre 900 e 1400 metros de altitude. A topografia montanhosa, com clima chuvoso no verão e frio/seco durante a maturação dos frutos e colheita, confere ao café sabor característico e diferenciado. Resultados de concursos de qualidade mostram que o café produzido na região da Mantiqueira está entre as melhores do mundo. “Em 2005, saca produzida na Fazenda Santa Inês, em Carmo de Minas, obteve maior pontuação (95,85 pontos) e melhor preço no leilão internacional do concurso Cup of Excellence”, recorda Hélcio Carneiro, presidente da Associação dos Produtores de Café da Mantiqueira (Aprocam). O café da Serra da Mantiqueira também é reconhecido, desde 2002, no concurso da Associação Brasileira de Cafés Especiais (BSCA). Cerca de 30% dos lotes premiados nas doze edições do concurso são da microrregião. Ticiana Lopes, analista do Sebrae-MG, afirma que 68% dos cafés selecionados no concurso BSCA 2011 são produzidos na Serra da Mantiqueira. “Também estamos bem representados nos concursos da Emater, ABIC e Illy”, ressalta Ticiana. O responsável técnico do projeto Internacionalização do Café da Mantiqueira do Sebrae-MG, Rogério Galuppo, lembra que o consumo de cafés especiais, que valorizam a origem, região e o produtor cresce em todo mundo. Os cafezais da Serra da Mantiqueira também se destacam como atração turística. A Rota do Café – passeios às fazendas e lavouras premiadas, seguidos de explicações sobre a cadeia produtiva e degustações com baristas profissionais, atraem visitantes do Brasil e do mundo. Nayara Montandon, responsável pelo projeto de turismo do Sebrae-MG na região, afirma que a Rota é um importante atrativo do Circuito das Águas, no sul de Minas. Para ela, “as belíssimas paisagens do topo das montanhas e degustação de cafés especiais são experiências únicas, procuradas por apreciadores da bebida e turistas que procuram bem-estar e natureza”, destaca. No dia 2 de dezembro, a Aprocam receberá o certificado do INPI e concederá os primeiros selos aos lotes de café que cumprem as exigências estabelecidas no regulamento da Indicação de Procedência. A cerimônia será realizada na cidade de Carmo de Minas/MG, no Clube Urca, às 14:00. O Instituto Nacional da Propriedade Industrial concedeu a região da Serra da Mantiqueira o registro de indicação de procedência para o café, reconhecendo dois tipos de indicação geográfica: o de indicação de procedência (IP) e denominação de origem (DO). Segundo Sr. Altino Rodrigues Neto, diretor-geral do IMA Instituto Mineiro de Agropecuária, o selo concedido pelo INPI é importante para que os produtores mineiros ganhem mercado com a agregação de valor ao produto. "E atesta para o consumidor que o produto em questão possui propriedades de origem e qualidade diferenciadas", completa. Esta é a segunda região mineira e a primeira do Sul de Minas a obter o Selo de Indicação Geográfica (IG), na modalidade de Indicação de Procedência do café. O cerrado foi a primeira região que recebeu esse status, seguido agora, da região da Serra da Mantiqueira, que é composta por vinte e dois municípios. Registros do INPI e Hélcio Carneiro Pinto, Presidente da APROCAM.